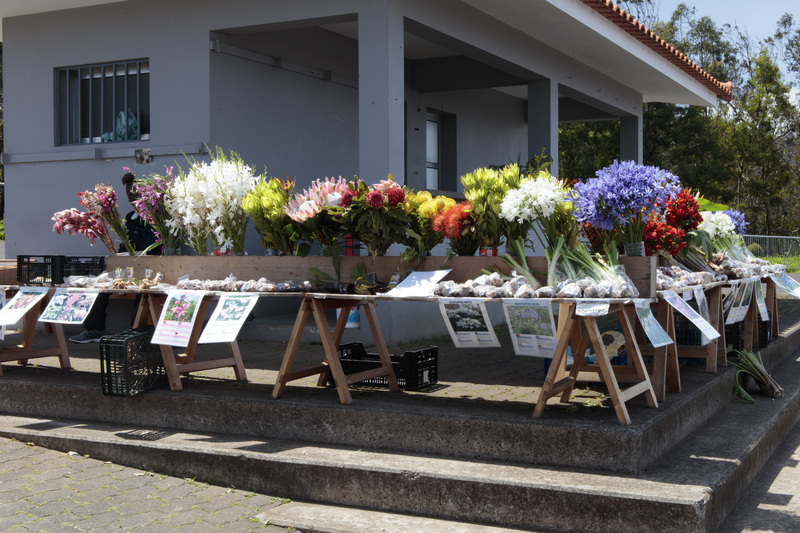 Our walking tour of Funchal began with the farmers’ market which has meat and fish markets at the back and plants, herbs, spices and seeds upstairs. Along the sides are independent shops. 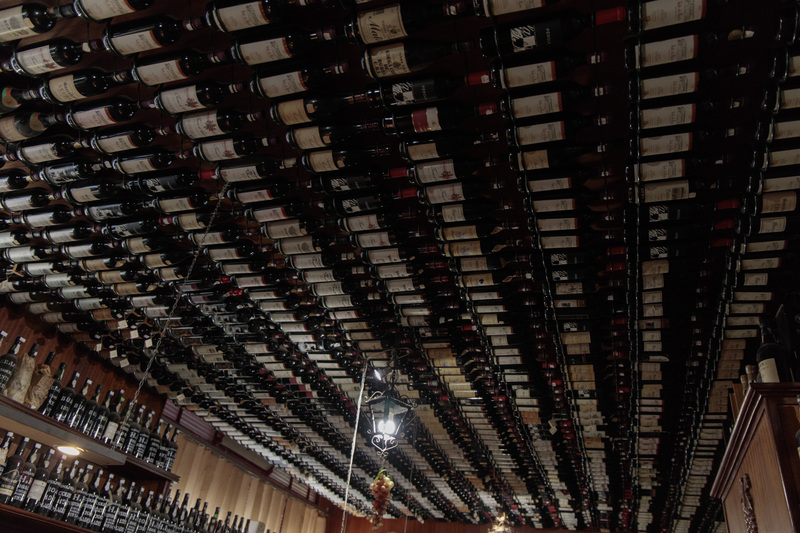 We found some rum of the north in a shop whose ceiling was composed of wine bottles. The proprietor told us how to best drink the rum: take a brandy glass and put in a teaspoon, add hot water and stir before removing the spoon & water and adding the rum. This is the best way to release the aroma. I also bought some seeds and some cardamom pods. 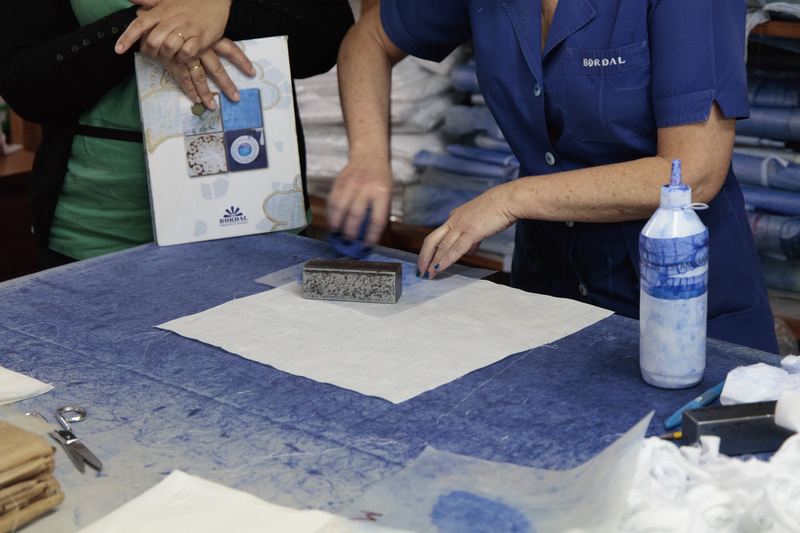 Our next stop was the Bordal Embroidery factory where we had a guided tour. Once the fabric has been prepared it is sent out to the embroiderers. Some items can take as much as three months to complete. 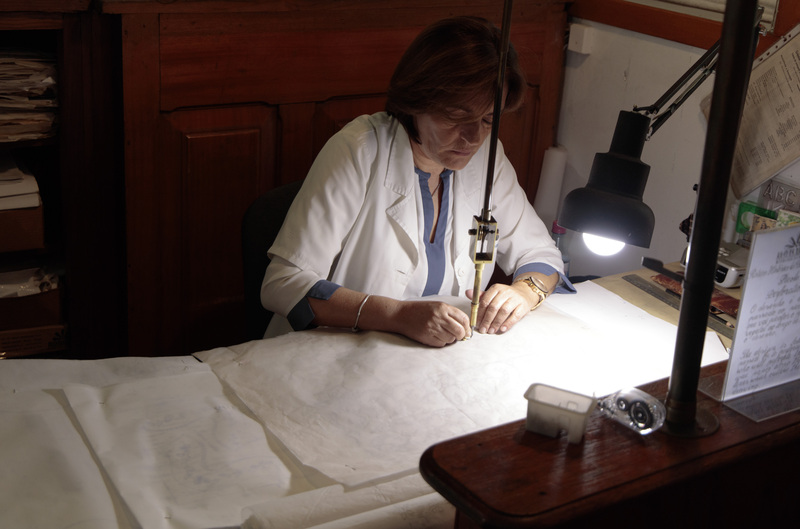 Their oldest embroiderer is 90 and we were told that no young people are taking up the trade so it may become a dying art. Continuing around the city streets we passed the taxi ranks. 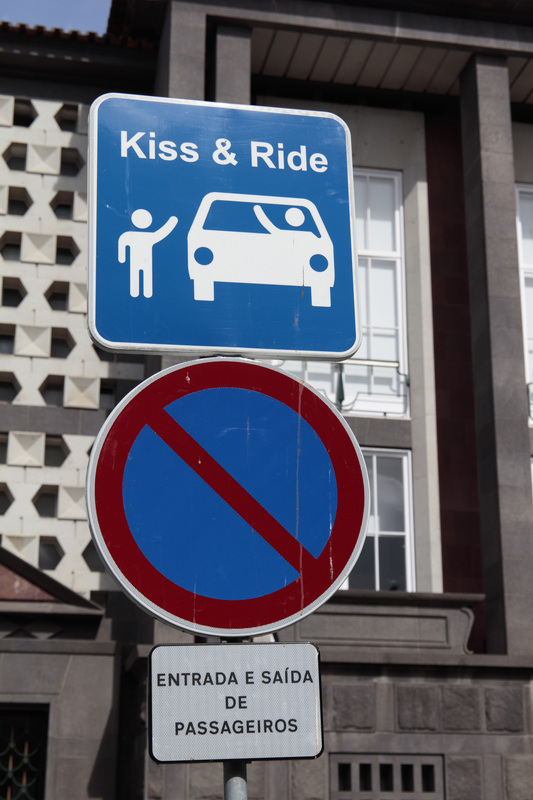 They are all yellow with a blue stripe in Funchal so easy to spot but this sign was interesting. We also visited the cathedral. 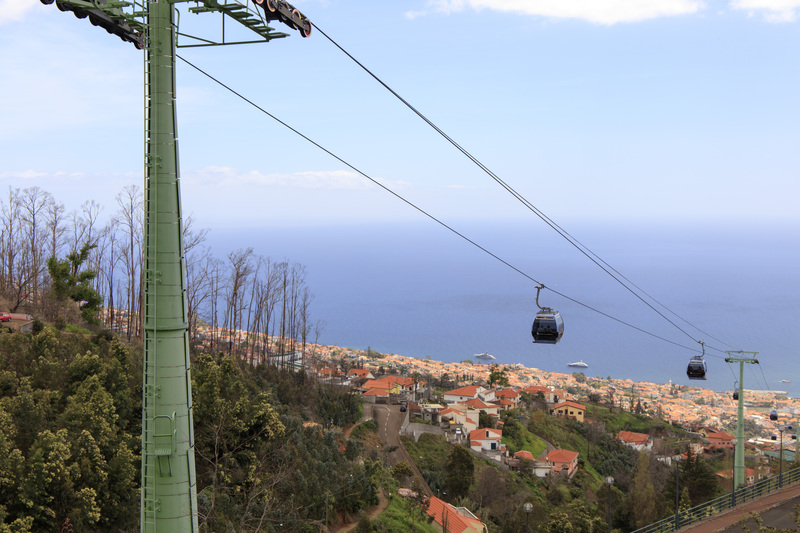 we took the cable car to the Tropical Garden at Monte. 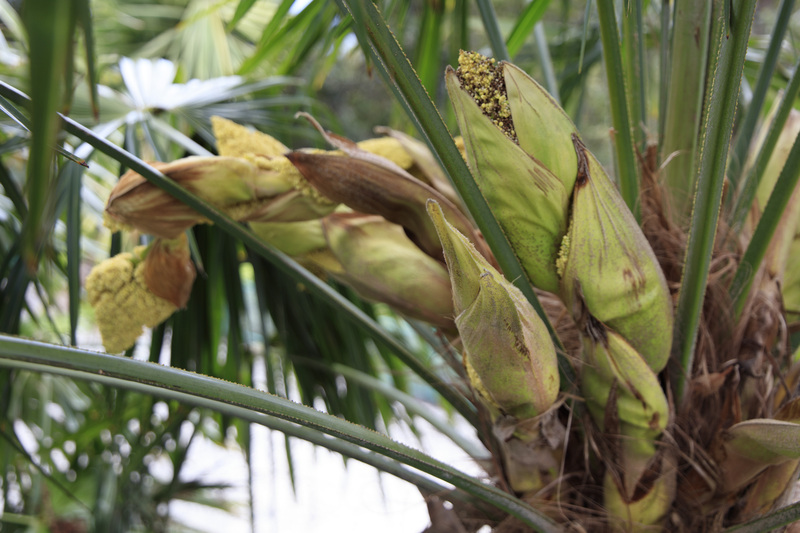 The gardens occupy 70,000 square metres and house tropical plants from around the world. I was rated as one of the 13 most beautiful botanical gardens in the world by Condé Nast Traveler. 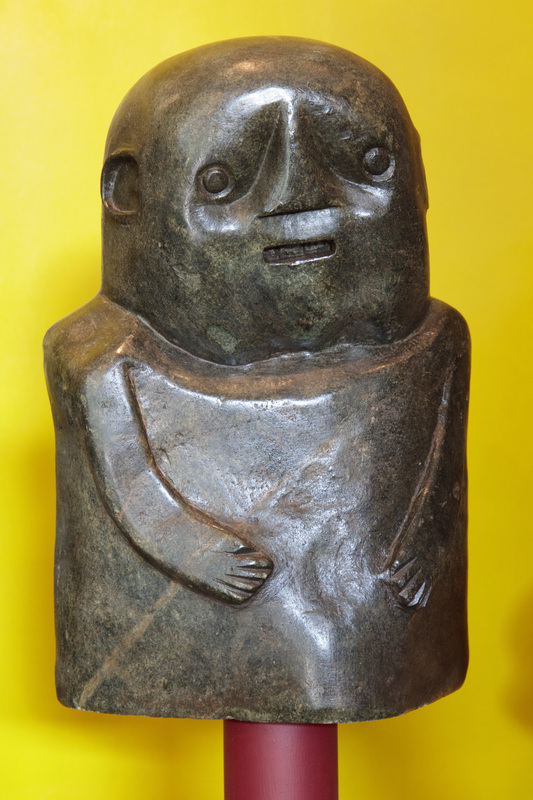 Monte Palace Museum holds exhibitions and on our visit the Berardo Collection from Zimbabwe was on display. There are also Chinese and Japanese gardens, native forest and mineral specimens. 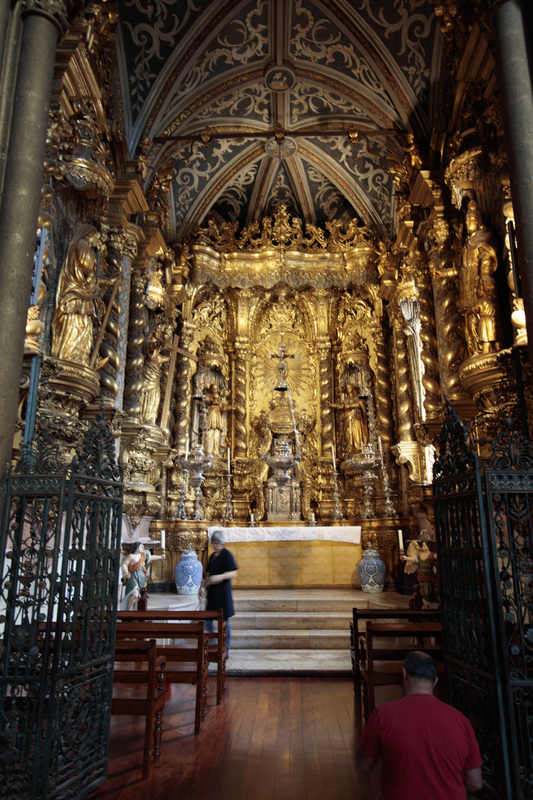 There are tiles from the 15th to 20th century and 40 tile panels outlining Portuguese history. 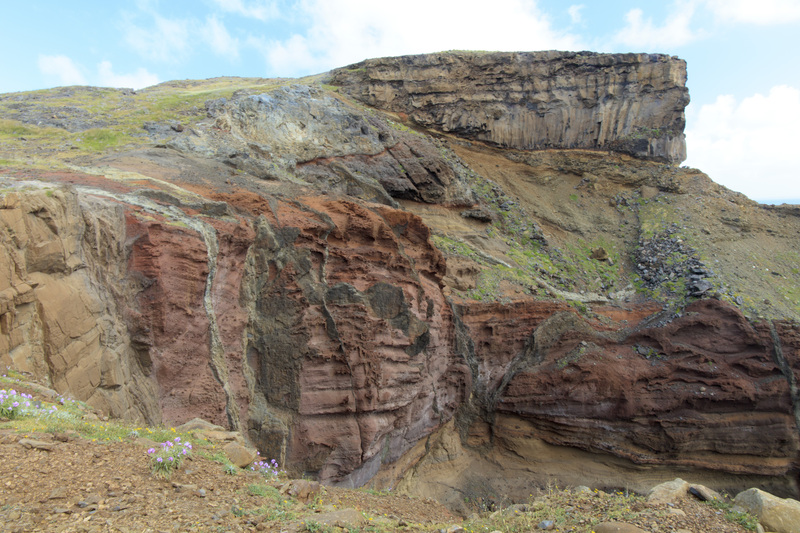 We walked down the the cafe at the bottom of the site and the steep upward return gave us some good exercise. The central lake has swans from Iceland and Scandinavia in winter. 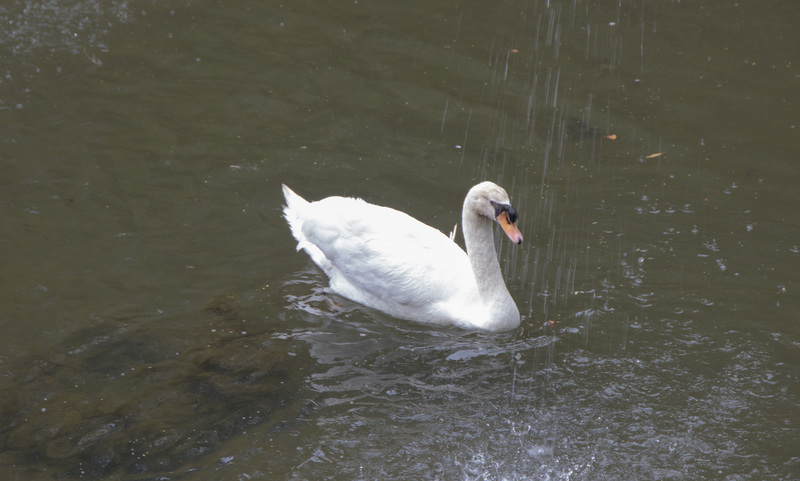 Most would have been on their way back to their breeding grounds in April but this lonely swan had an injured wing and had stayed behind. However, we took the more sedate cable car back down to the seafront. 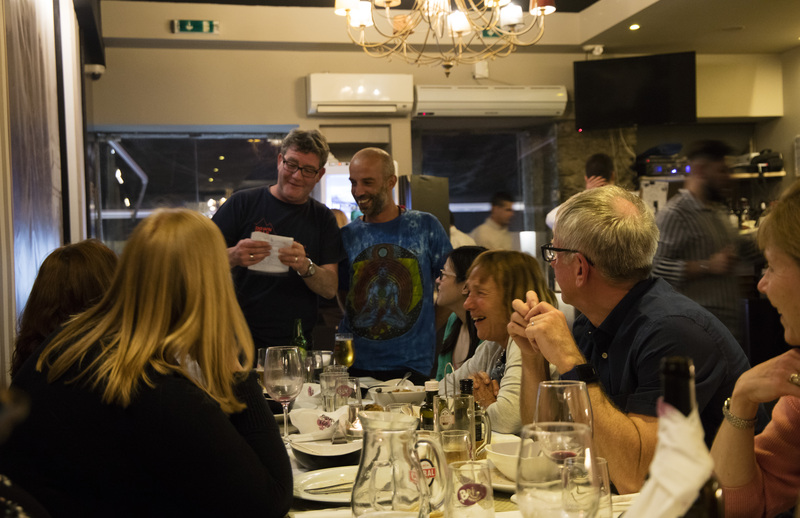 At the final group dinner in a local restaurant, we gave our group leader a signed boomerang in addition to his tip. 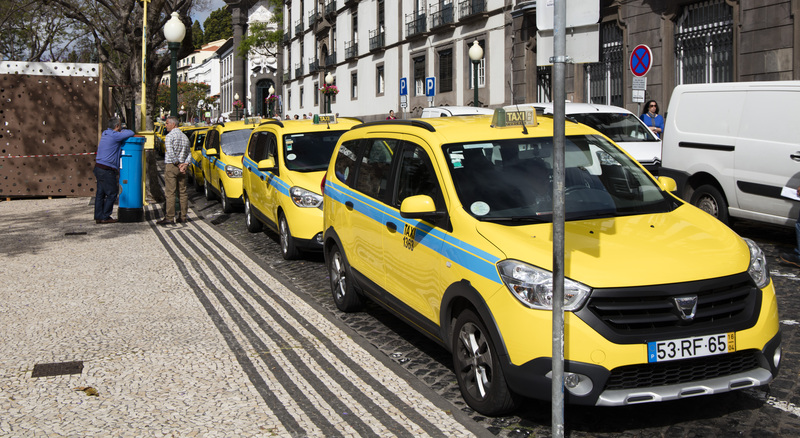 They are on sale in Madeira. I had always associated boomerangs with indigenous Australians, but it turns out that they were also used in Europe and Africa with the earliest one found in Poland. It was made from a mammoth tusk and estimated to be around 23,000 years old. 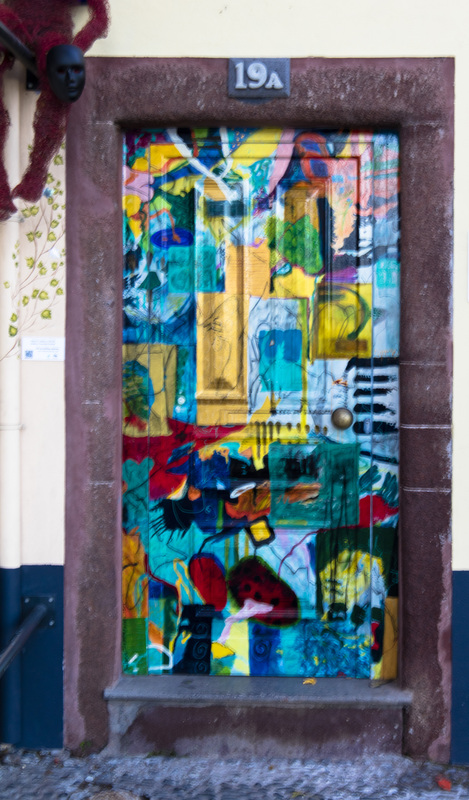 There is so much more to be seen in Funchal: gardens, museums, the Frente Mar walk along the shore and other areas of the island to explore so I am sure that we will be back. 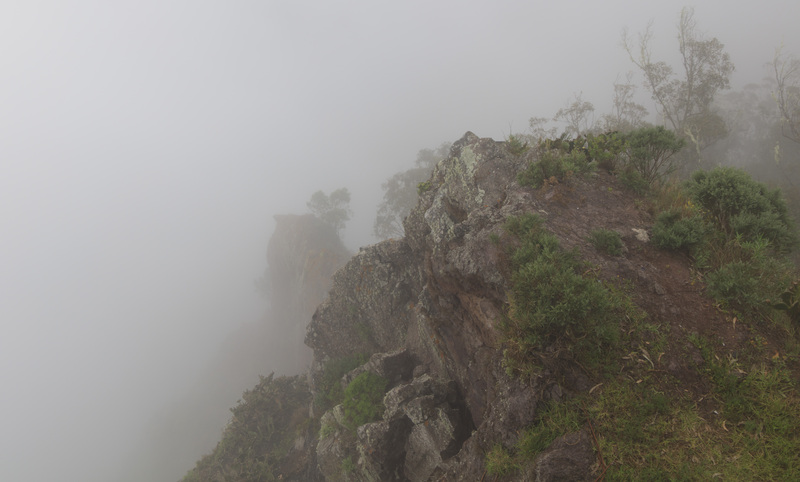 The original plan for our last day before returning to Funchal was the mountain walk from Pico do Arieiro to the highest peak, Pico Ruivo (1862m). However, the weather was not looking good. 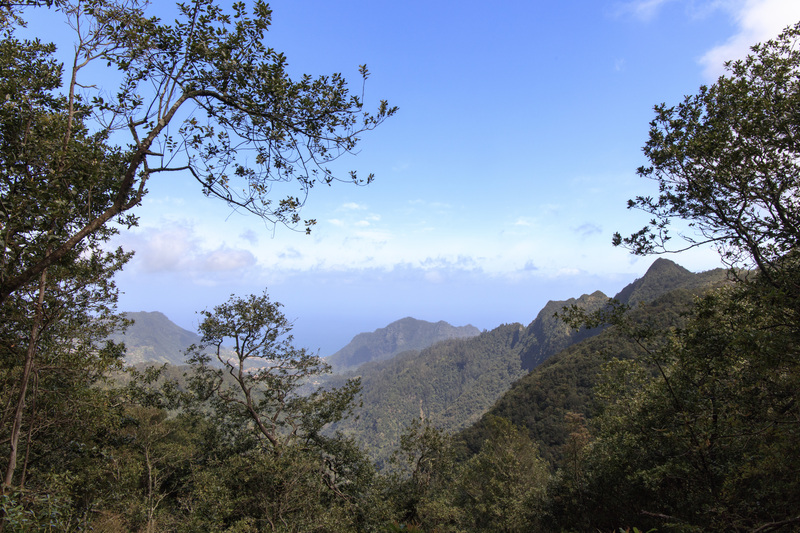 It was decided not to make the final decision until we arrived at Pico Do Arieiro, where the cameras could be checked and locals consulted. En route we stopped off at the viewpoint at top of Europe’s highest cliff, Cabo Girao. 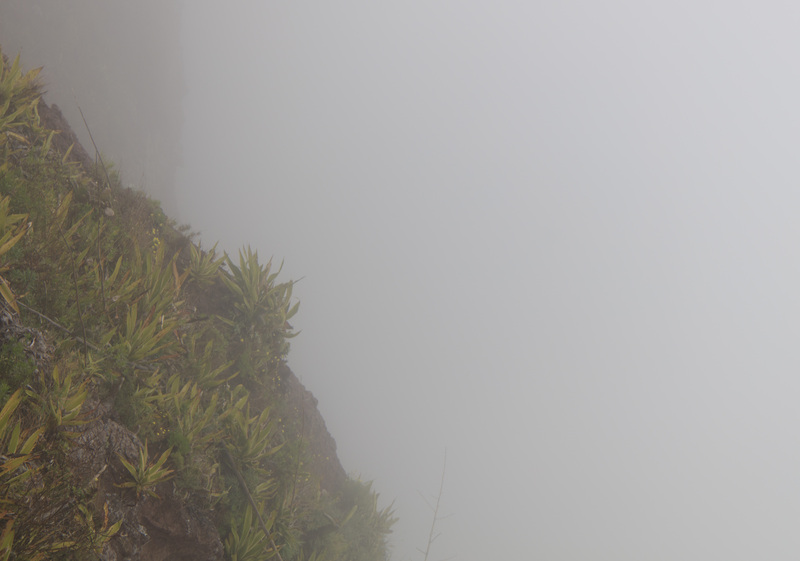 It is 580m high (the highest cliff in the world is in Hawaii). Unfortunately we could see very little due to the cloud but in good weather, the glass skywalk would give fantastic views below. 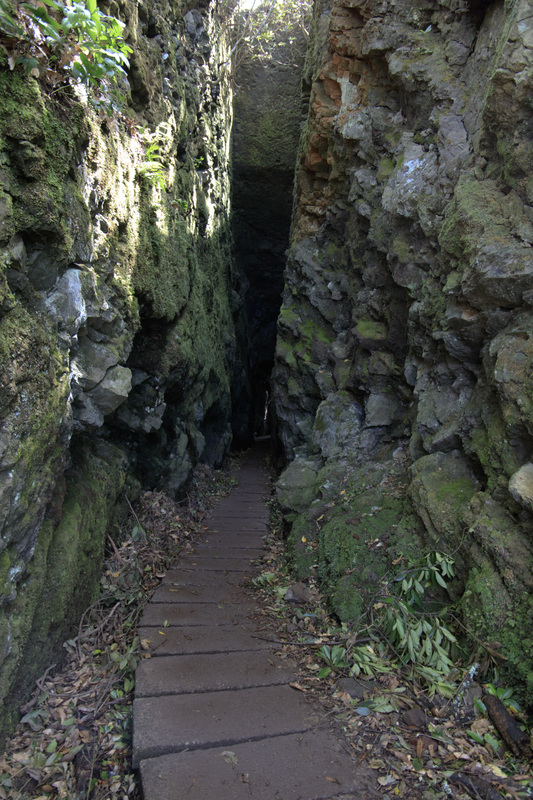 In places the path sneaks through narrow passages between the rocks. A forestry track took us down to the road in Portela. There was a very conveniently situated bar which made a good resting place and a flower market taking place nearby. Although we were disappointed not to be able to do the mountain walk we had a pleasant day at lower altitudes. We left our hotel shortly after the sun rose behind the cliffs. Sunrise is considerably later this far south than it is in the UK. 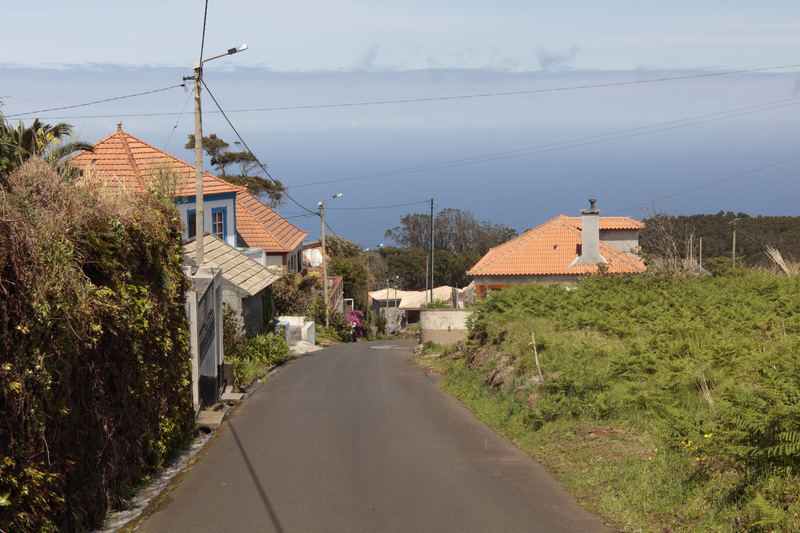 We were driven to Faja da Ovelha where we walked among the gardens and past fields of flowers, fruit trees, vegetables and herbs to Prazeres, a natural terrace where there is a tea house. 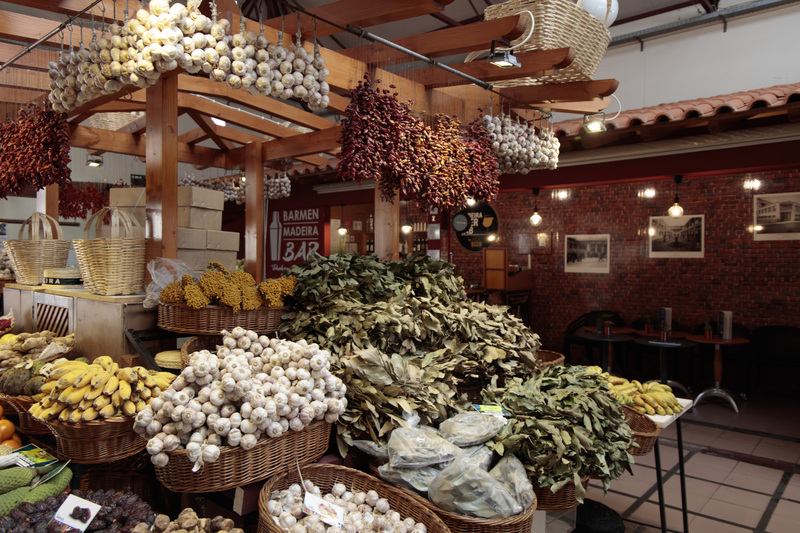 It sells jam, honey, liqueurs, dried herbs and teas. 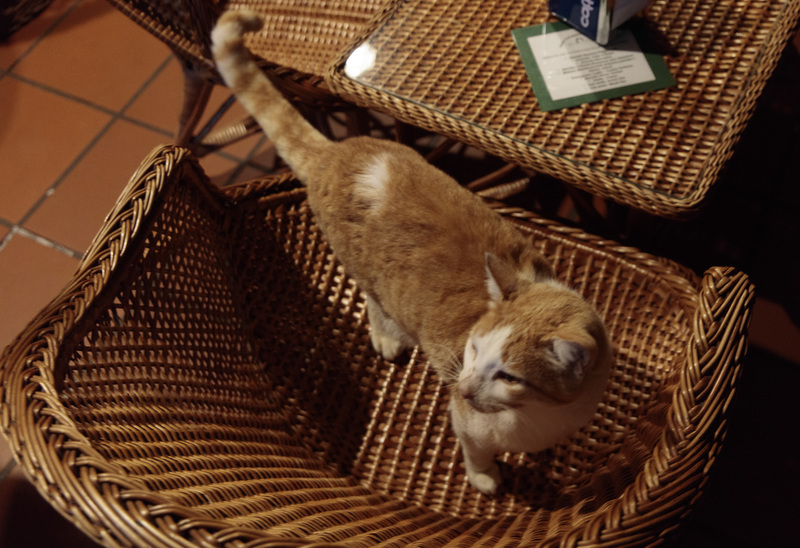 There was even a cat to welcome us. The project is devoted to improving the community and sustainability of a rural society. They buy raw materials from elderly farmers which improves the local economy and is fair trade. There is an art gallery (closed when we visited unfortunately) and a number of animals and birds to see. 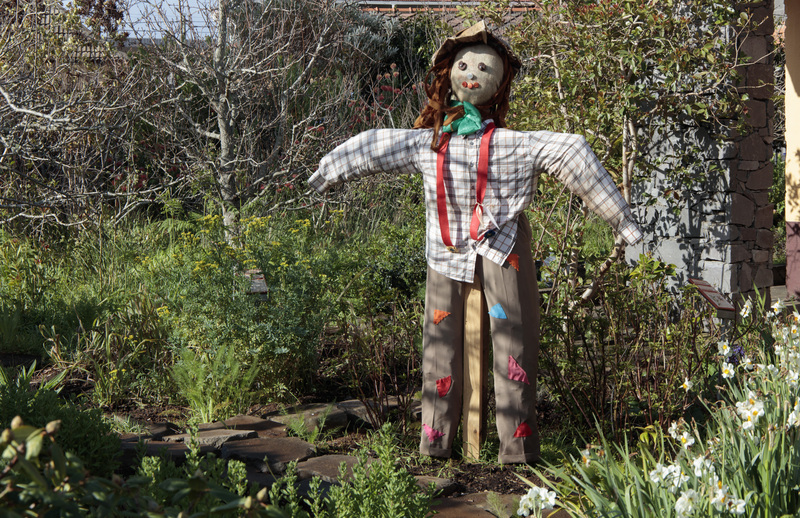 All around the local area there are figures which look a little like scarecrows, constructed during a project by local school children. There is one in the garden here. 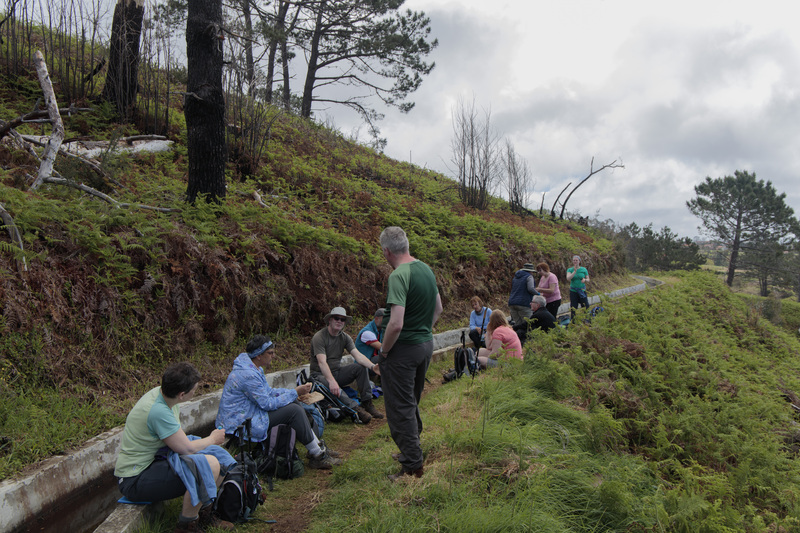 We then began our walk on the new Calheta Levada which winds around the hillside through the community. Growers are allowed to open it to water their land for one hour in the morning in rotation. 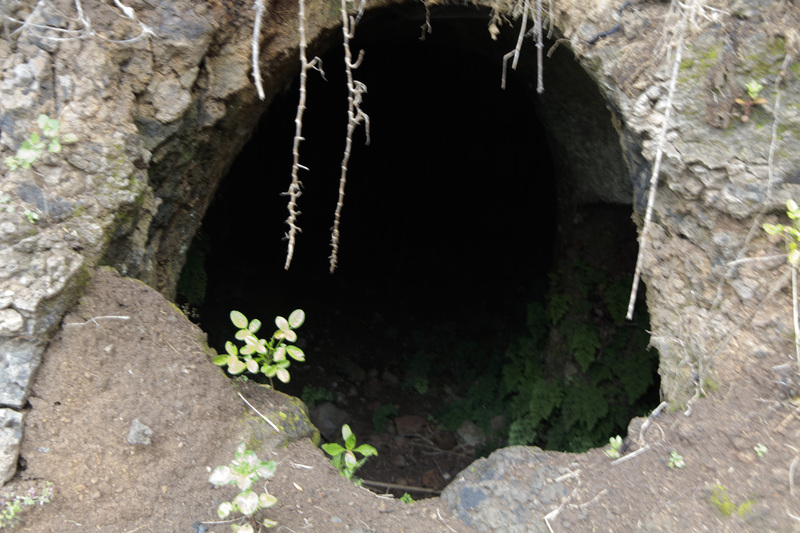 Before local government took over the management of the levada use, there were frequent fights and disputes about who was using more than others. We passed the church and an old press which had previously been used to make the local white wine. 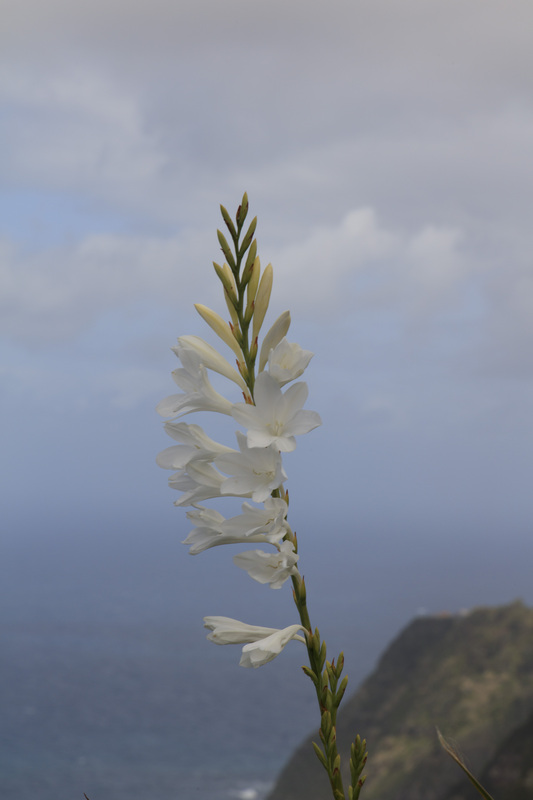 Back among laurel trees and farmland, the Levada was flanked by plants used to make tea and herbs, some of which had medicinal uses. 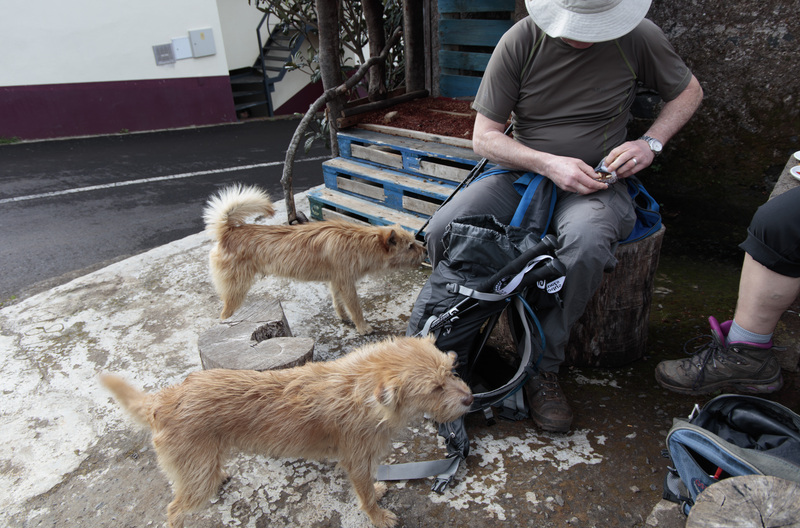 We had elevenses at a café where the local dogs appeared to see if they could scrounge anything. Afterwards we entered more open farming country and spotted a long-toed pigeon. Lunch was eaten sitting on the concrete banks. 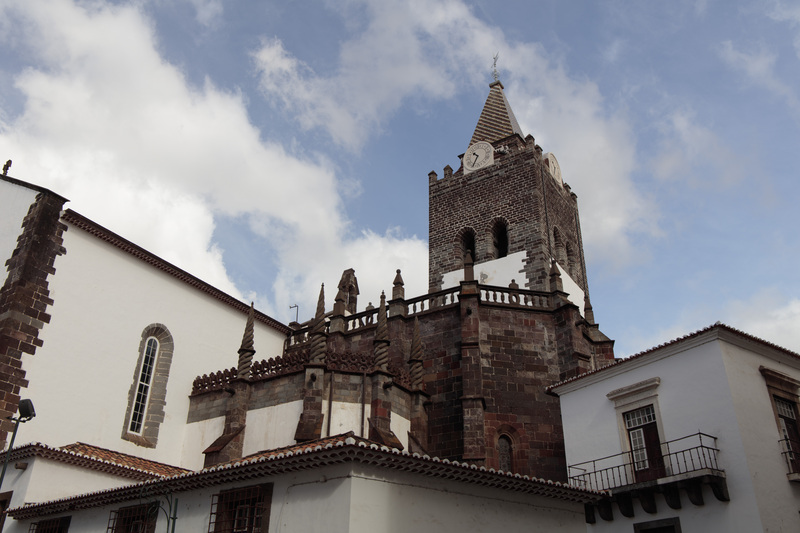 We came to the second oldest church in Madeira, built in 1648 but which was unfortunately not open. 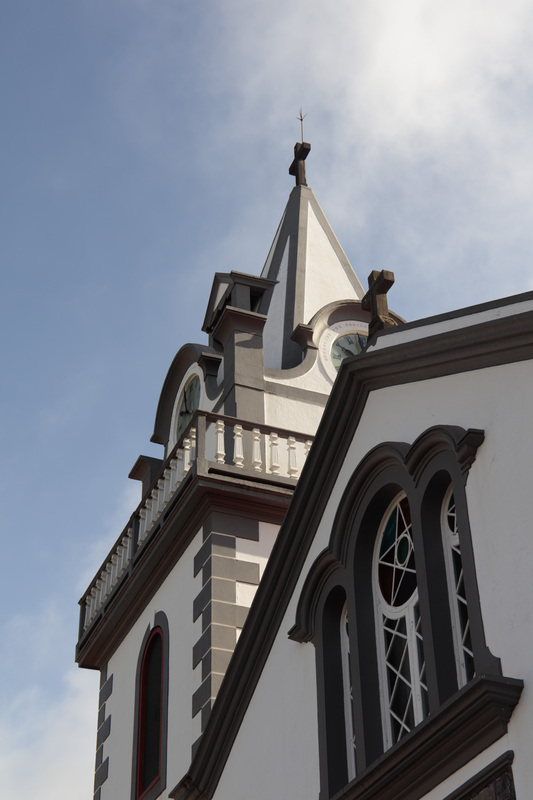 The oldest was on the site of the current cathedral in Funchal. 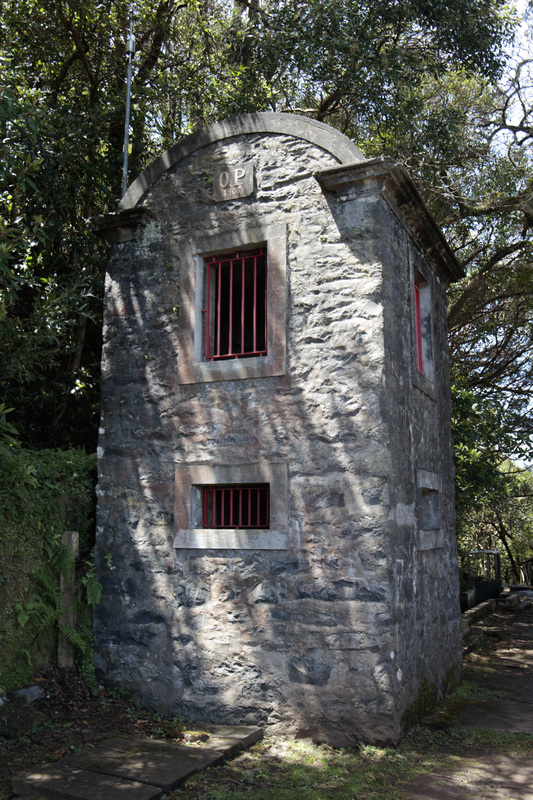 The former community wash house was still there and also holes in the rock which had been used in the past as water reservoirs. After a beer at a bar overlooking the coast, we made the remainder of our descent down a cobbled path which was constructed by the villagers so that farmers and fishermen had access to the coast. It zig-zags down to the coast and our hotel. 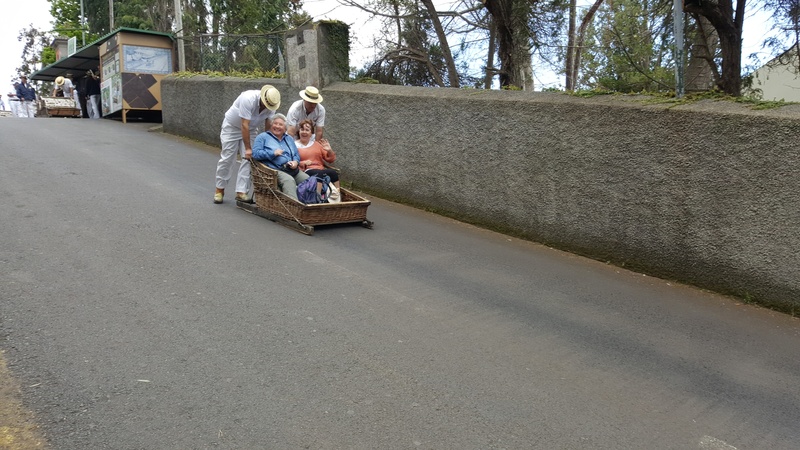 Madeira had no roads until the 20th century and these cobbled paths were the means of walking or of a bullock cart dragging a load around the island. Many new roads, bridges and tunnels have been and are still being constructed which have aided communication and transport. 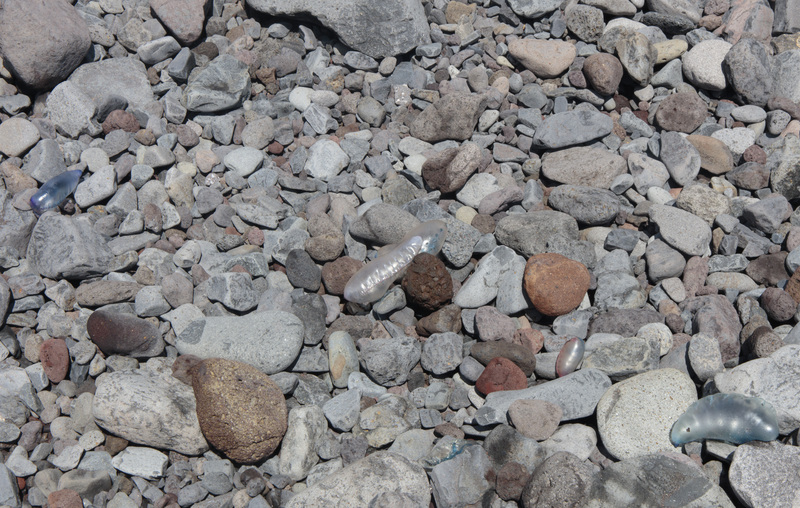 We passed one large construction site building a bridge and hoped that all the topsoil removed would be distributed to where it is need on such a rocky island. Eventually we completed our 500m descent and arrived back at the hotel. A brief wander on the beach which is mostly pebbles with a little black sand, yielded only a tiny piece of sea glass and the remains of Portuguese Man of War Jellyfish. Our evening meal was at a waterside restaurant. I had hoped to get some sunset photographs, but the cloud and rain moved in and put paid to that idea. We walked back listening to the calls of the shearwaters who nest in the cliffs above the town and descend to the ocean at night to feed. 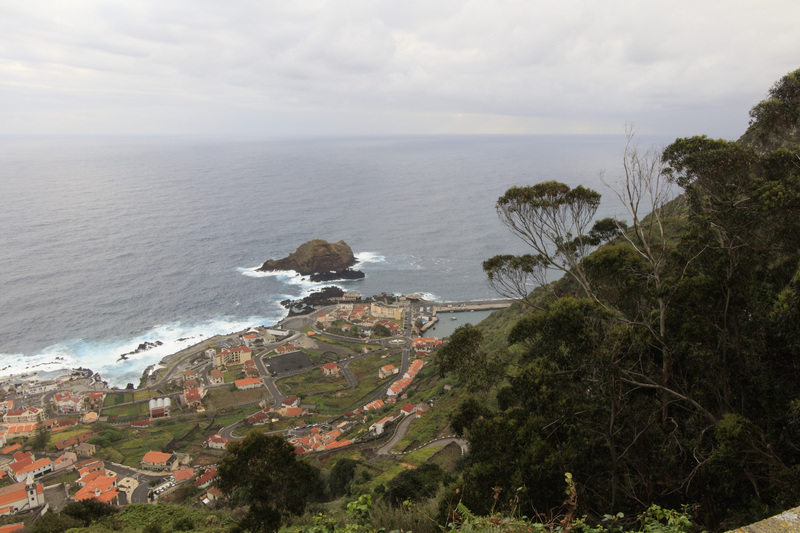 On our third morning we left Porto Moniz, stopping at a view point to look over the town from above. 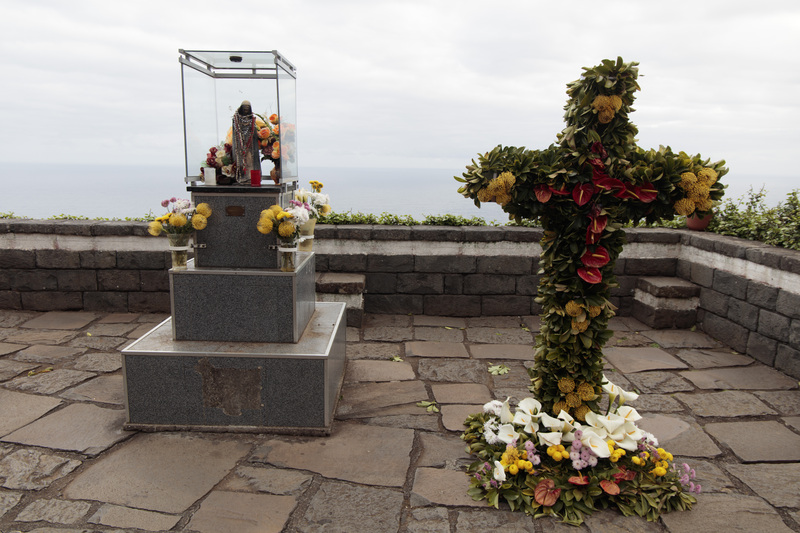 There was a shrine at the view point. 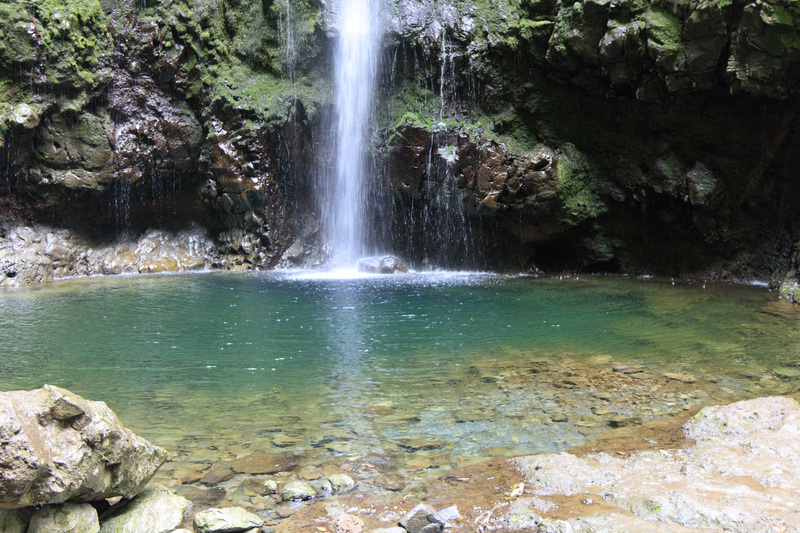 Our walk began at Ribiera da Cruz with a steep trek up to the waterfall Madre dos Levadas. Our guide does some geocache hunting and found one near the foot of the fall. We passed through woods with bracken and gorse which made us feel we were in the UK. However, there were also many eucalyptus trees introduced from Australia. 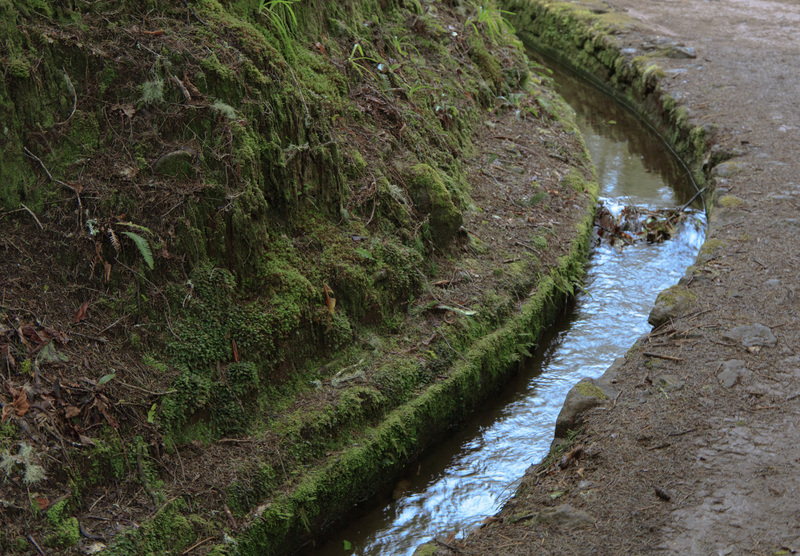 The Levada do Moinho was built to serve several water mills which are now ruined. 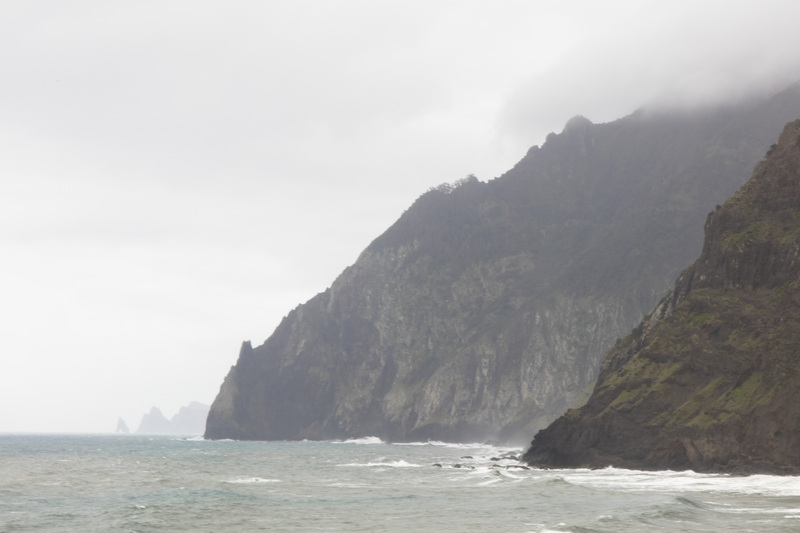 After a traverse and descent alongside it, we arrived at Santo do Porto. Lunch was at picnic tables next to the cattle market. 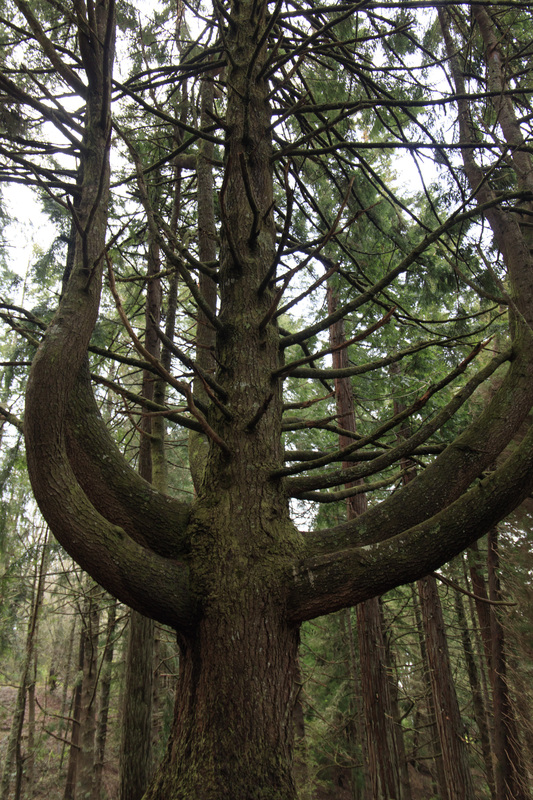 There was a tree which had grown around a still functioning water tap. 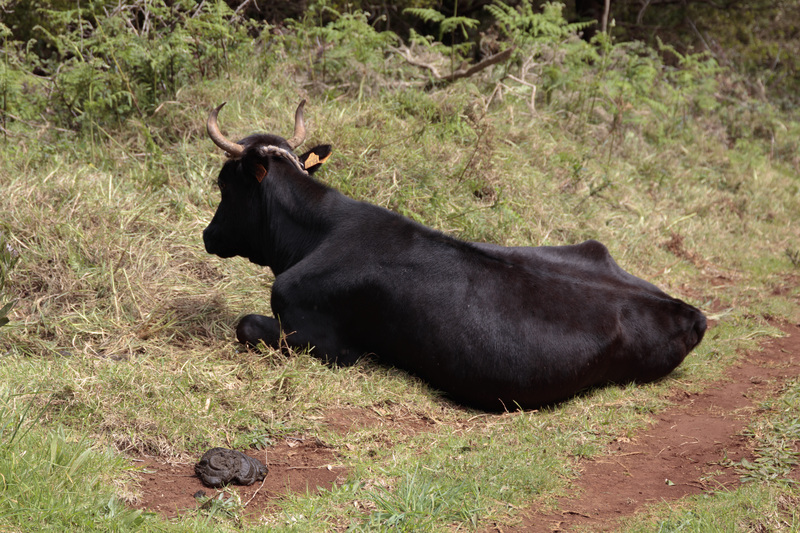 We then continued descending for another 45 minutes in farmland, passing a cow resting in the sun. 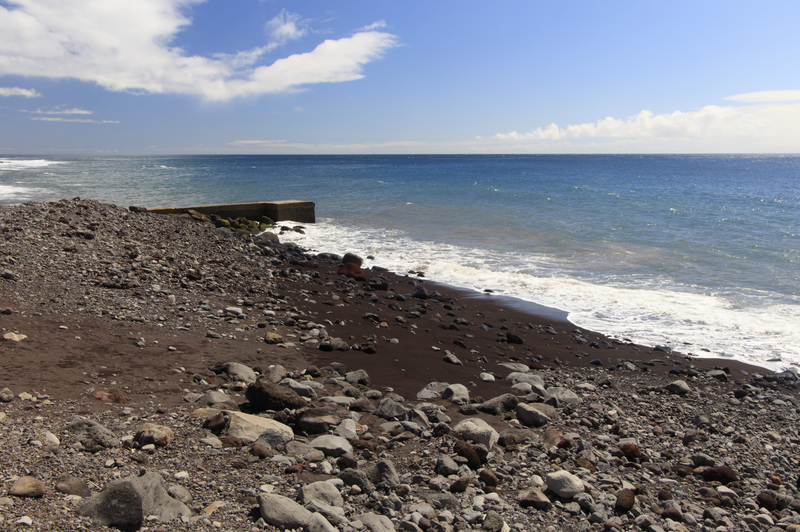 A diversion was necessary to avoid the part of the path which had now become a river due to the recent rains but we were almost back in the edge of Porto Moniz. 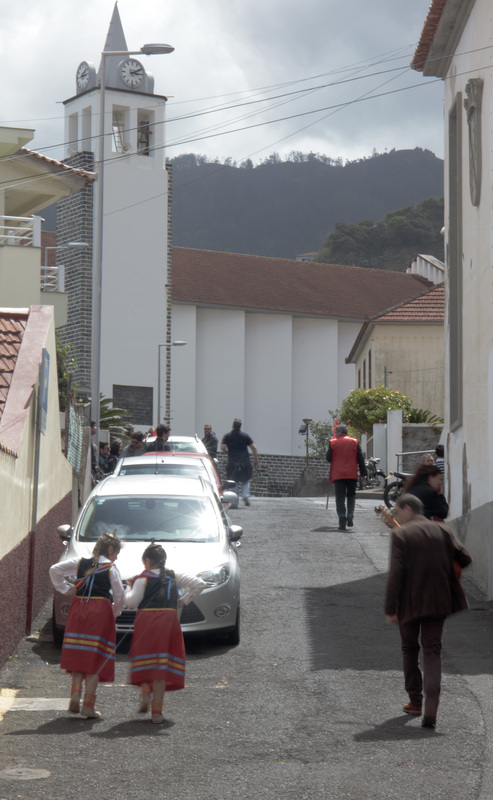 There are many empty and derelict homes, depopulation and an ageing propulation being a problem for parts of Madeira whose total population is only 250,000. 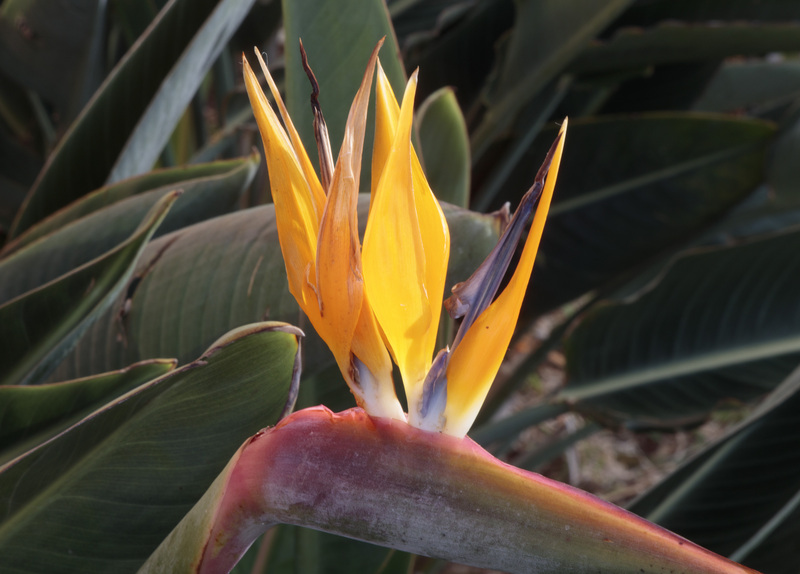 There were many imported plants such as Strelitzia from South Africa and the Ginger Lily (Hedychium gardenerianum) which hails from the Western Himalaya and has become something of a pest. 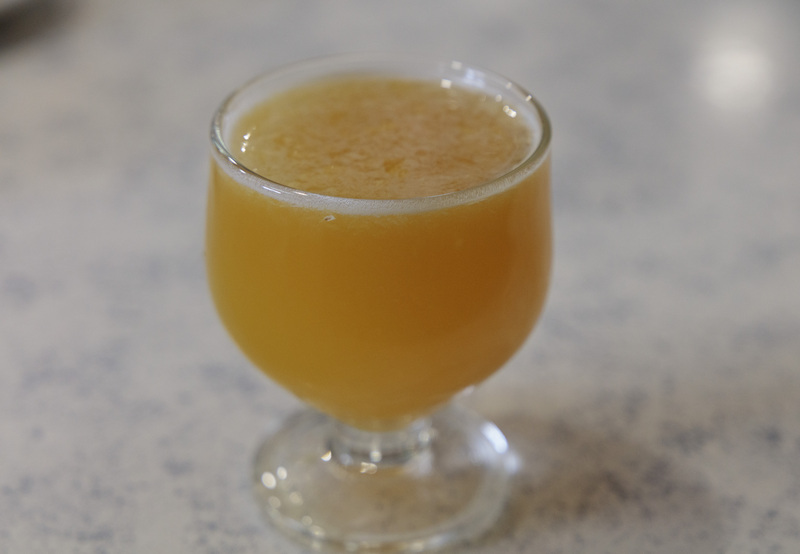 We sampled the local Poncha in a bar. It is made from aguardente de cana (sugarcane alcohol), sugar honey and lemon. Here it is, being prepared prepared for us and the final product. Needless to say, there was no more walking after that we were driven to our hotel on the southwest coast in Paul do Mar. 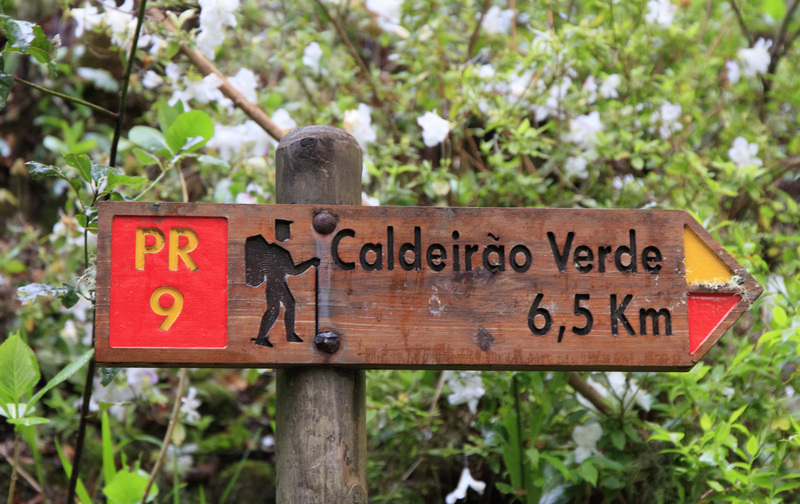 We left early for the short drive to Queimadas where the Levada do Caldierão Verde which runs for 6km through a UNESCO protected laurel forest: the Laurisilva. 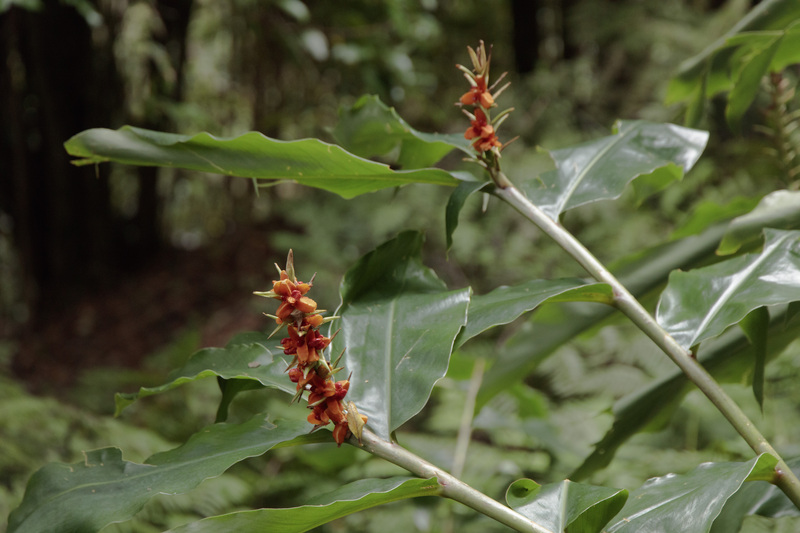 This is one of the few remnants of native forest and is made up of the laurel, or bay tree (Laurus novocanariensis), the lily-of-the-valley tree (Clethra arborea), the Madeira laurel (Ocotea foetens), Madeira mahogany (Persea indica) and a number of flowers. There are also some non-natives and this one has been named the candelabra tree. 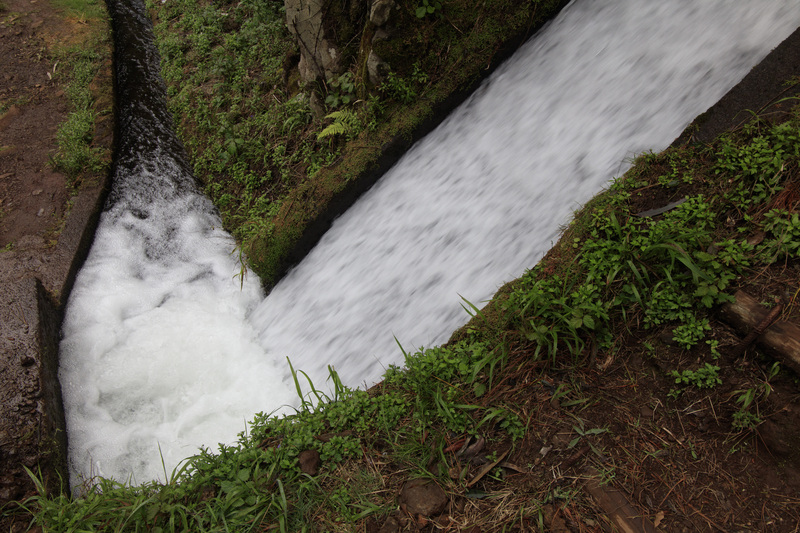 Levadas are channels built by hand to carry water from the north of the island to the drier south. 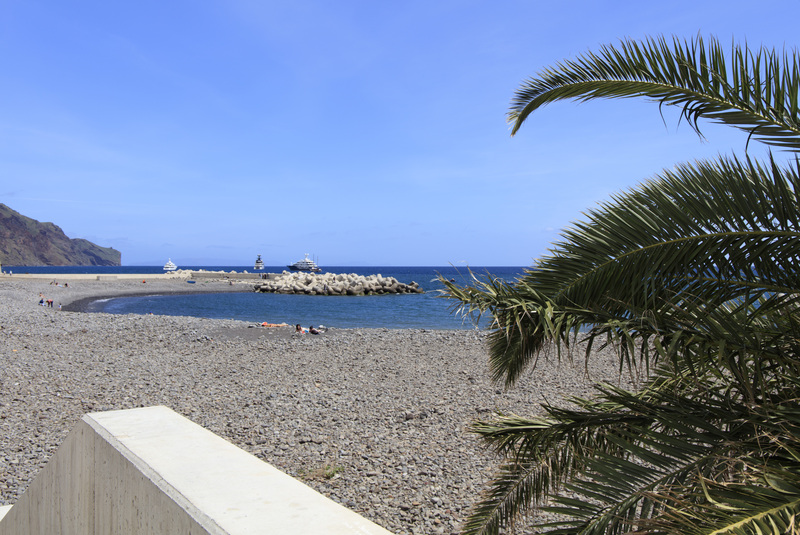 Slaves from Africa and La Gomera in the Canaries were used as labourers in the early days. Building the levadas continued until the 1940s. 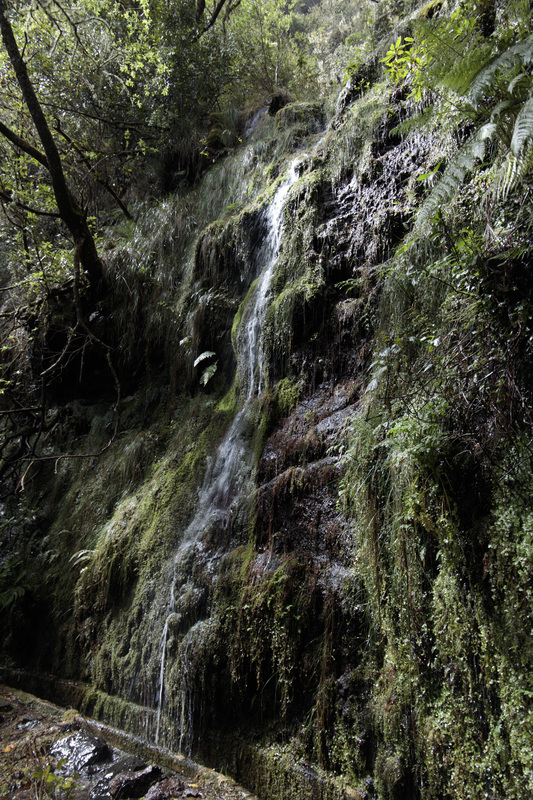 The one we followed runs to the the highest waterfall in Madeira which falls 100m at around 900m altitude. 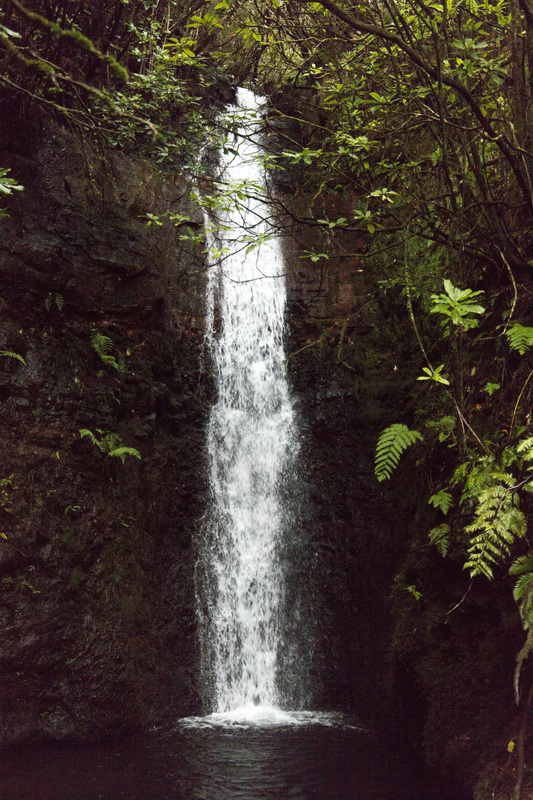 It rained, although we had dry skies for lunch at the foot of the fall. 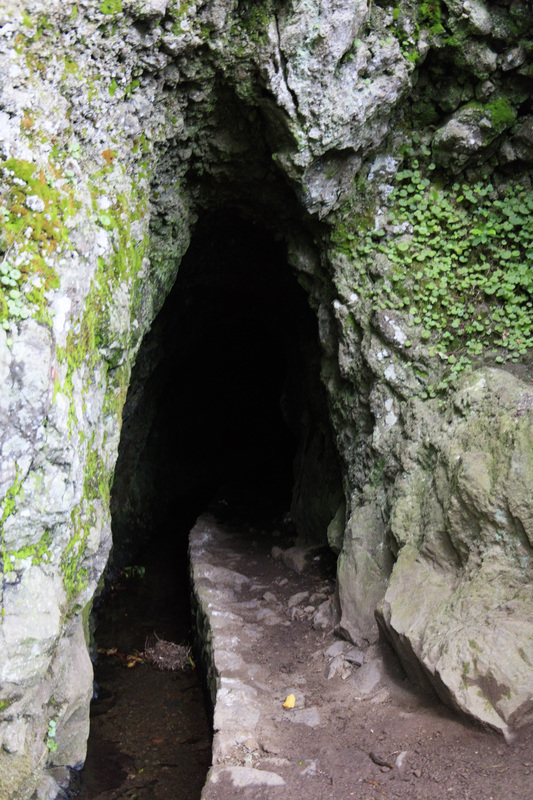 The trail passes through three tunnels, some of which have low ceilings and torches are required As we emerged from one, a pregnant cat was there to welcome us. 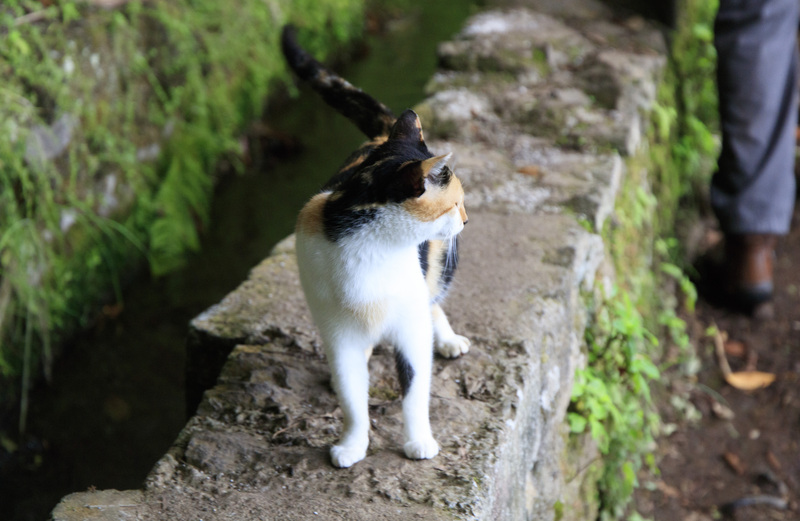 Our guide told us that sometimes the locals would go away on holiday and just leave their cats to roam on the mountainside. 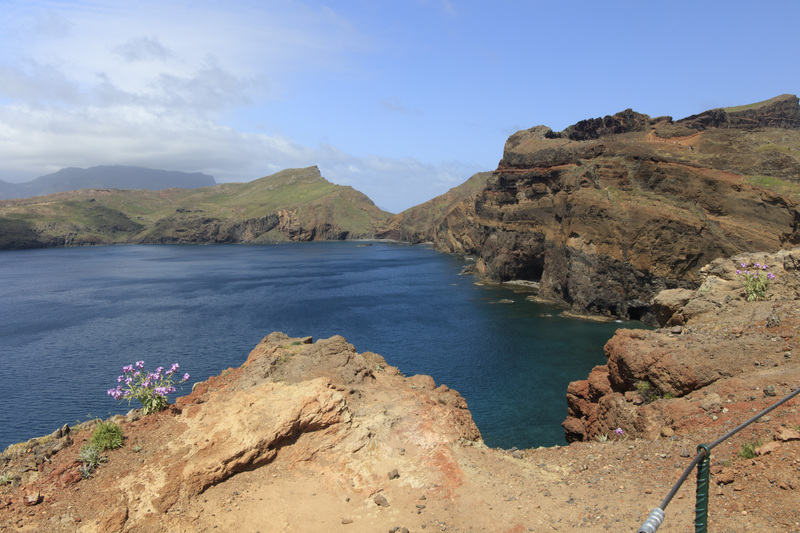 This walk only involved around 100m of ascent and then a slippery descent to Verdeda da Ilha. The path (mostly steps) was built alongside streams which were used to send felled timber down to the village. The vegatation included gorse, sweet chestnut trees, eucalyptus and mimosa. We had very brief glimpses of a fire crest and a Madeiran chaffinch and also heard a blackbird. 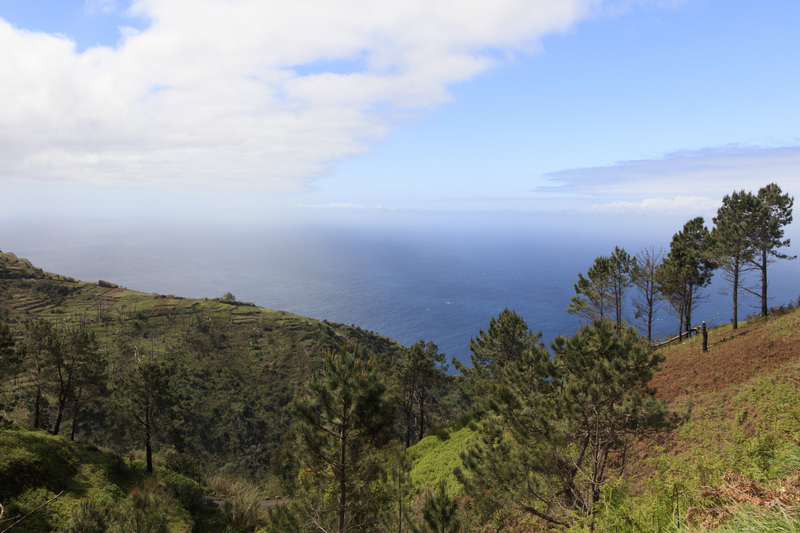 After tea and cake at a local cafe, we were driven along the north coast to Porto Moniz, stopping at a viewpoint at Beira da Quinta along the way. It took 16 years to build the new road and it gives views of the old, winding north coast road. 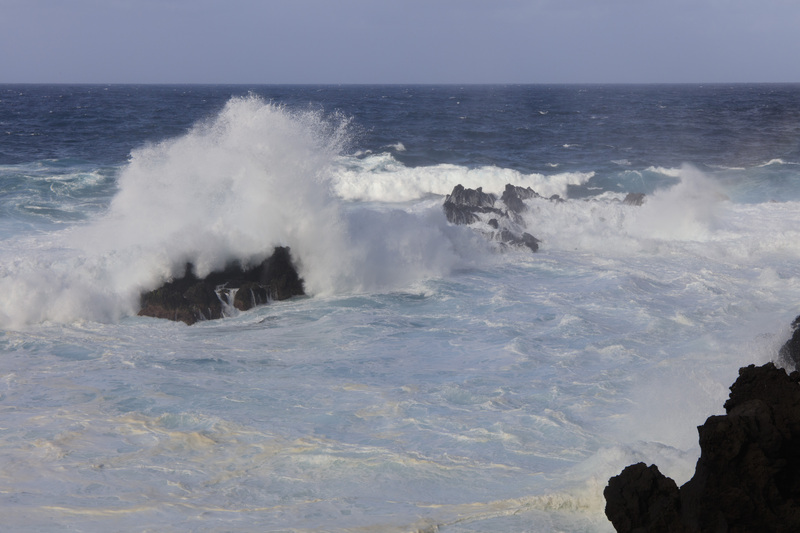 Porto Moniz has natural lagoons for swimming in but this was not possible on our visit given the high winds and waves. 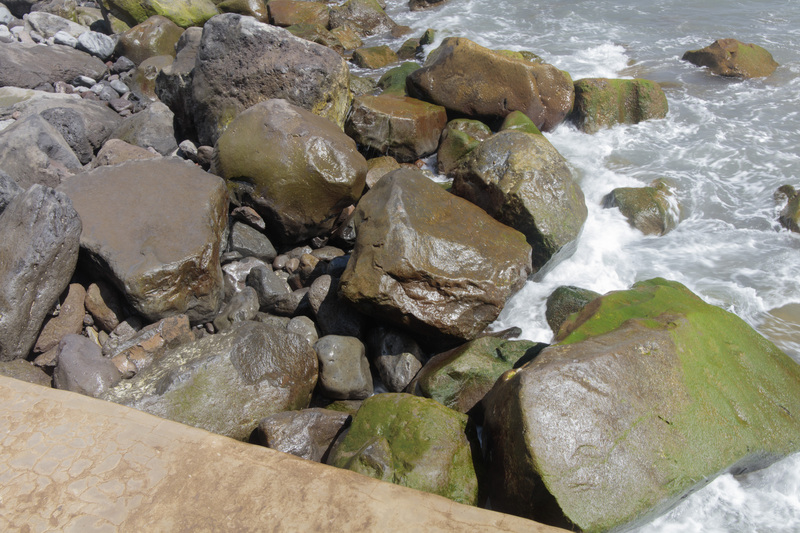 The rock in harbour is Ilhéu Mole. All along the promenade waves were crashing on the rocks. In places there was some yellow/orange foam suggestive of pollution. 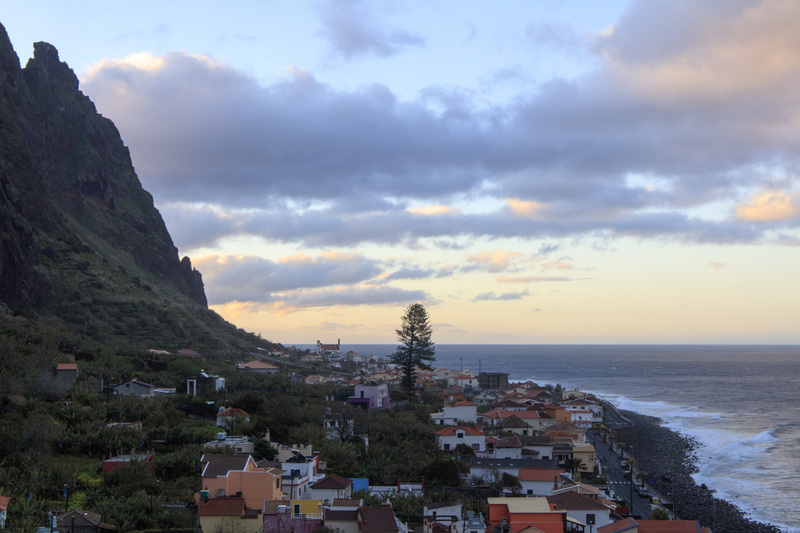 As we landed at Funchal, one of the flight attendants said that it was the first time she had been on a plane that had landed on its first attempt. 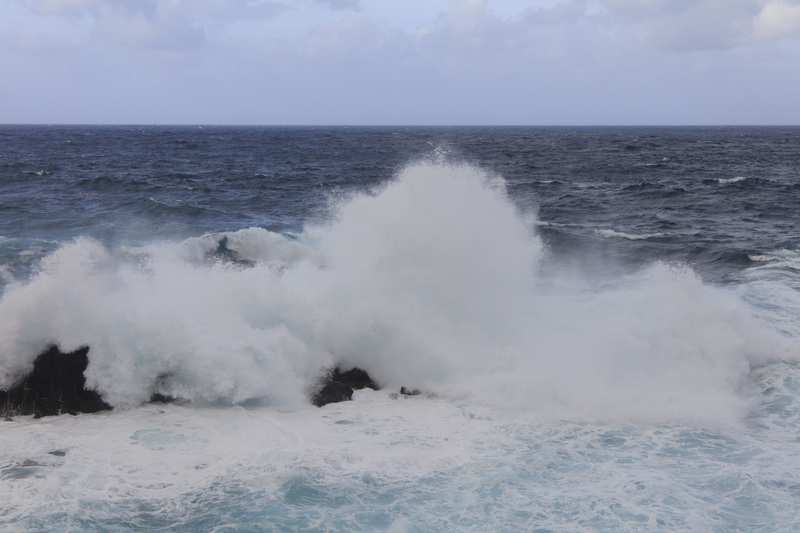 We had had a 100mph tail wind so had arrived 25 minutes early but did not experience any of the gusts of wind that Madeira’s airport is renowned for. 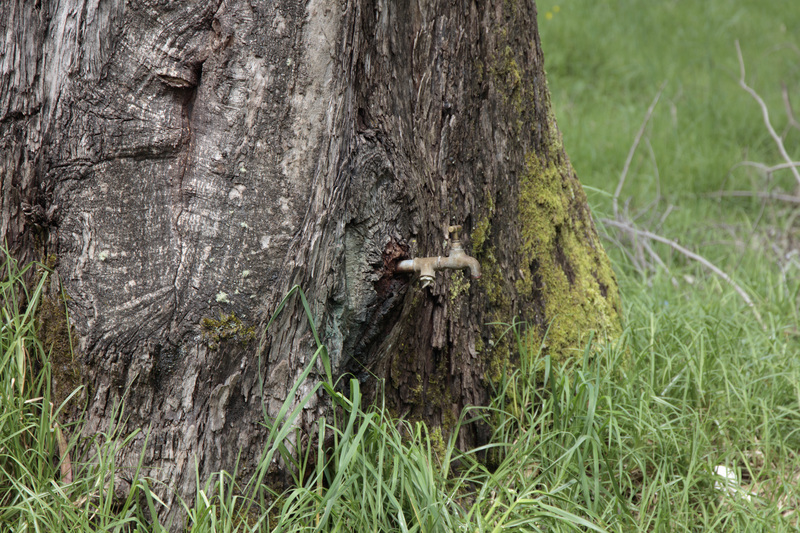 These often lead to landings having to be aborted and re-attempted. Apparently after the third failed attempt the plane has to divert to Lisbon. The runway has been extended and now projects over the sea supported by concrete columns. 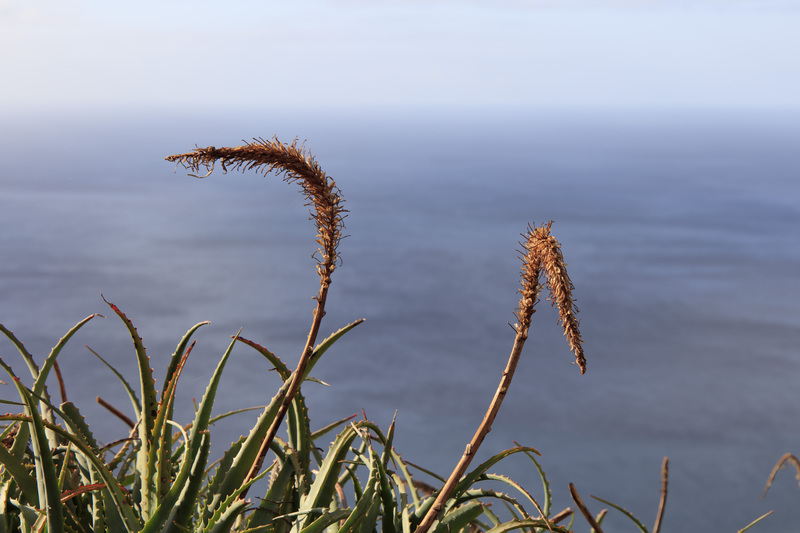 Funchal is named after ‘funcho’, the Portuguese word for fennel which it is said, was abundant when Zarco landed here in 1419. 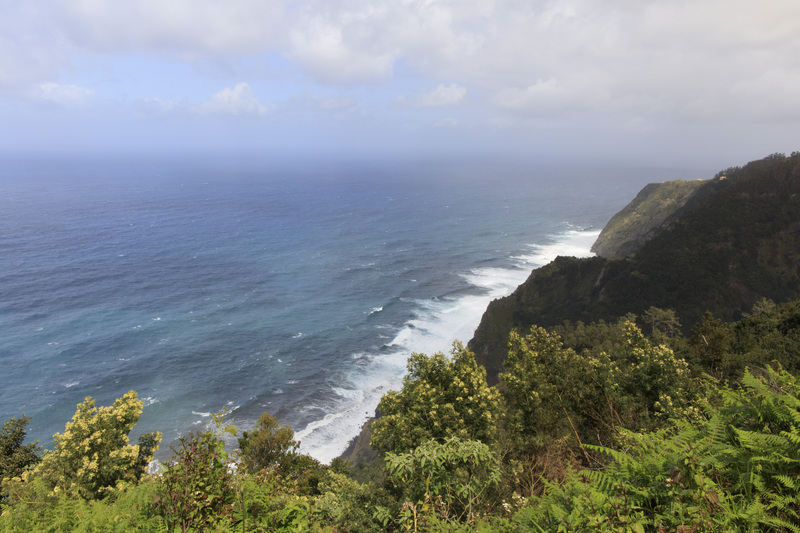 Madeira means ‘wood’ which is somewhat ironic as the first settlers began burning and ultimately completely destroying the primeval forest and indigenous flora and fauna. 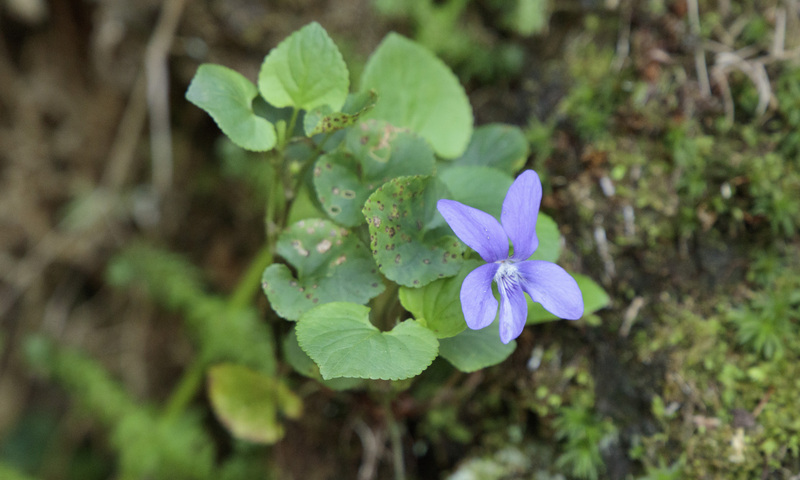 Much of the current flora has been introduced from all corners of the earth. We had dinner that evening in a restaurant specialising in local food. Dessert was strawberries from the restaurateur’s farm. 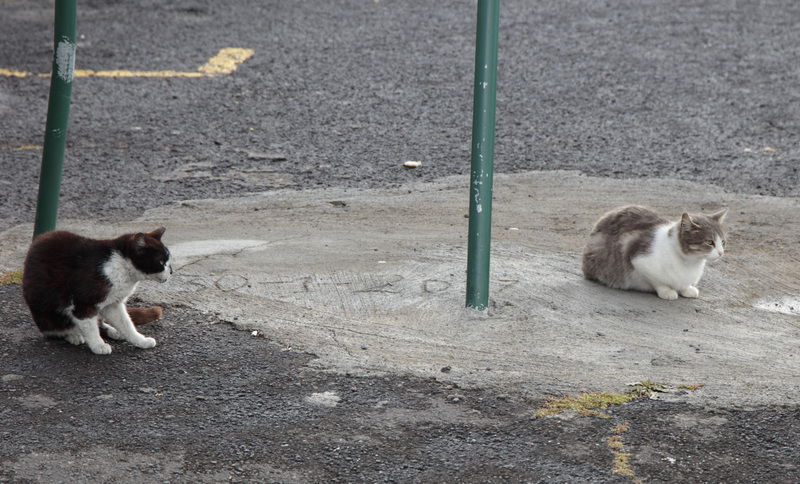 On our way out, we noticed that the local cats and dogs were gathering, ready to eat the scraps they are given. 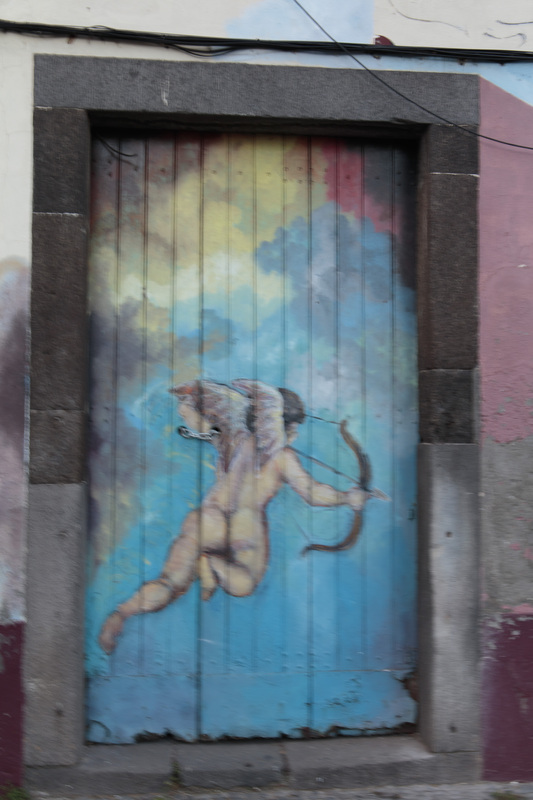 Walking along a cobbled street back to the hotel, we passed lots of street art including these examples on a derelict building. 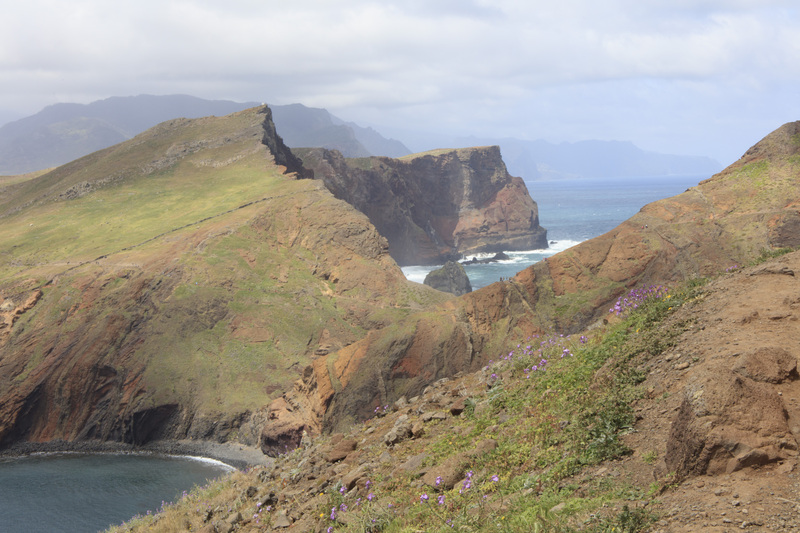 The following morning after passing through Machico, (the first place Portuguese explorers landed in 1419) we stopped at a viewpoint on the coast. Feral cats were hanging around hoping for food. Just before we left, a local woman drove up and began to feed them. 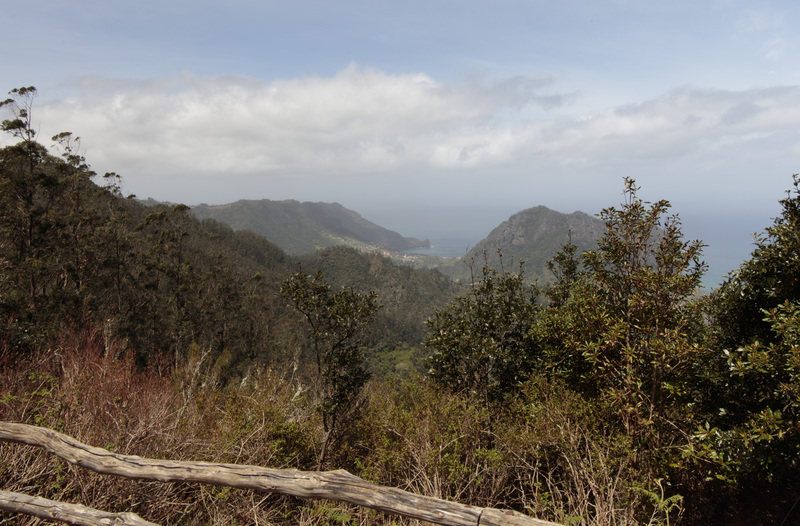 Our first walk was an 8km circuit involving climbing the equivalent of 119 flights of stairs on the Ponta de São Lorenço National Park peninsula. 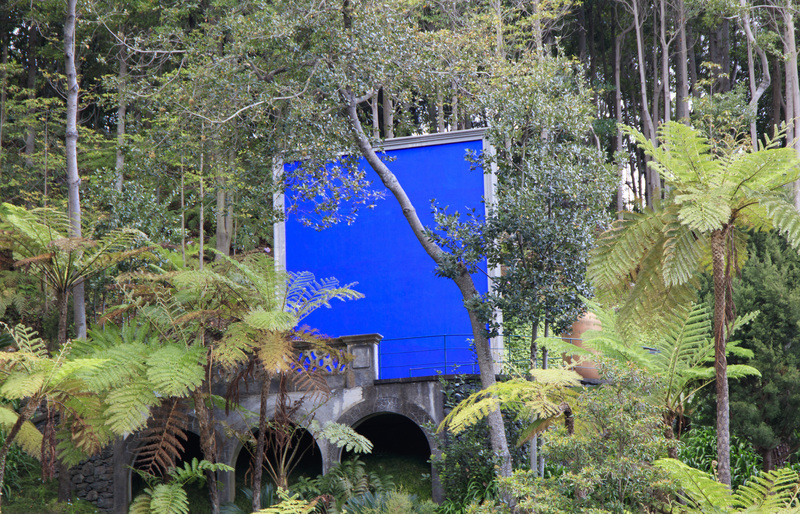 By the national park centre, we spotted several canaries but none of them stayed still long enough for a photograph. 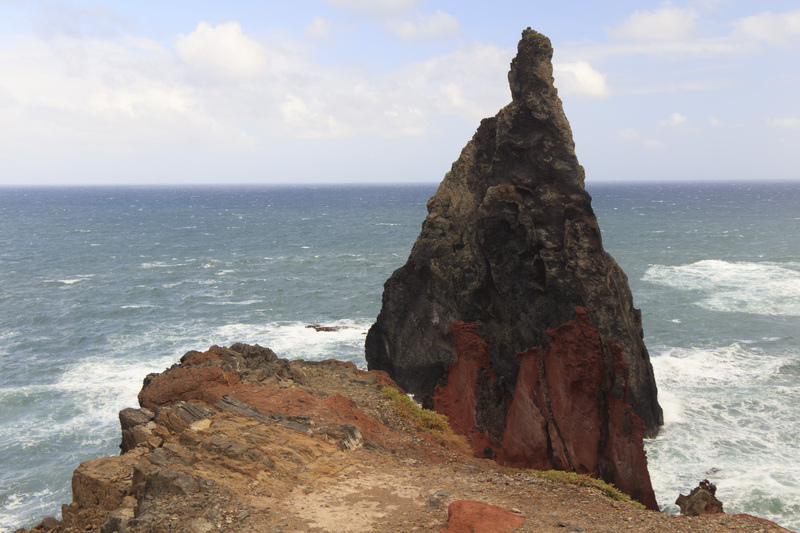 The volcanic geology gives rise to many scenic views although it was very windy. 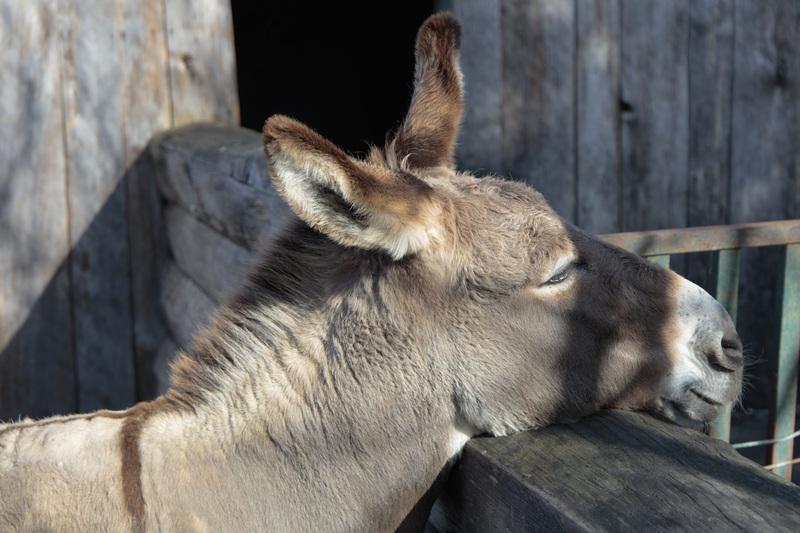 It was busy, but it was a Sunday and in the Easter holiday season. 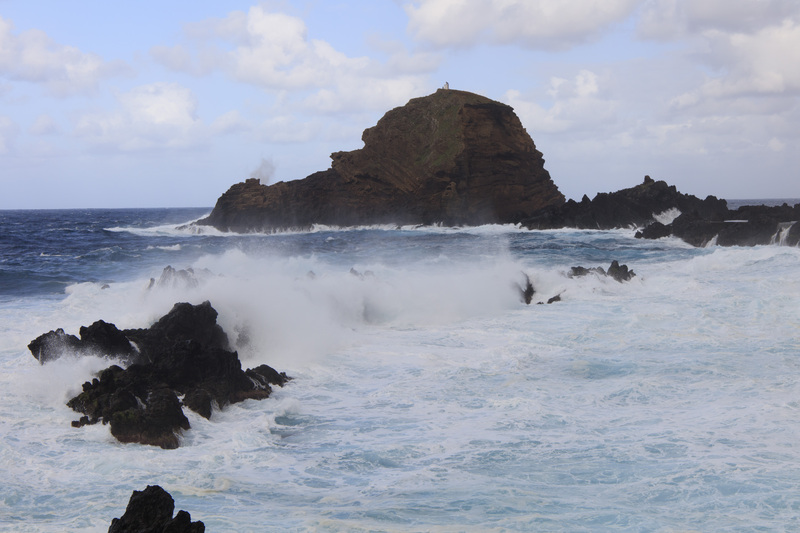 Afterwards we drove inland west to Porto da Cruz which is the first eastern town on the north coast. 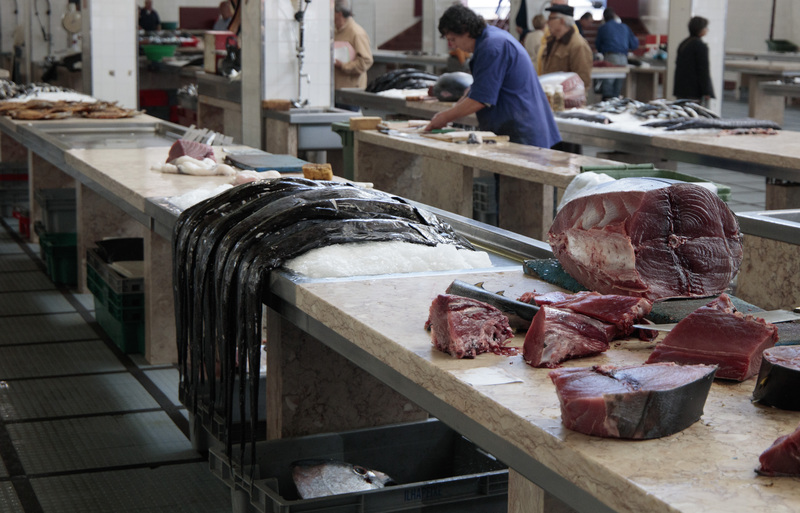 We had a tasting session of a local fish like tuna (Gaiado Seco) which is salted and dried in sand. It was served with olive oil, tomatoes and onions with bread. 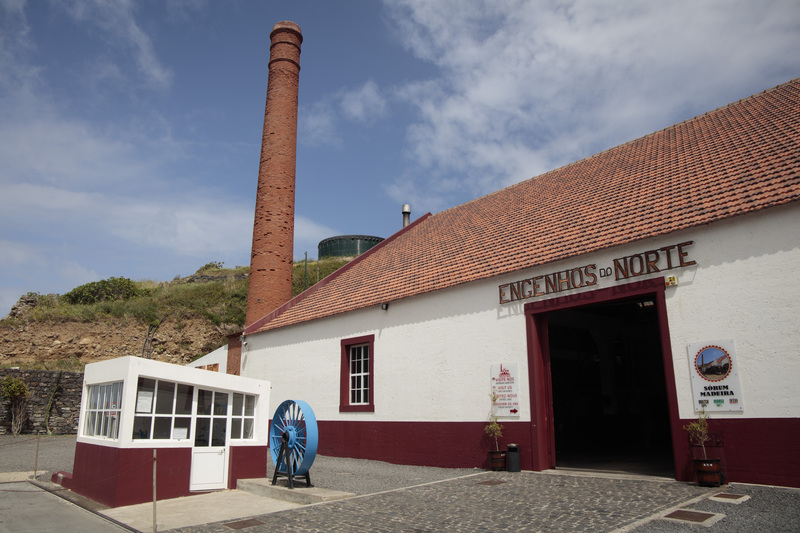 The sugar cane mill, ’Engenhos do Norte operates between March to May. 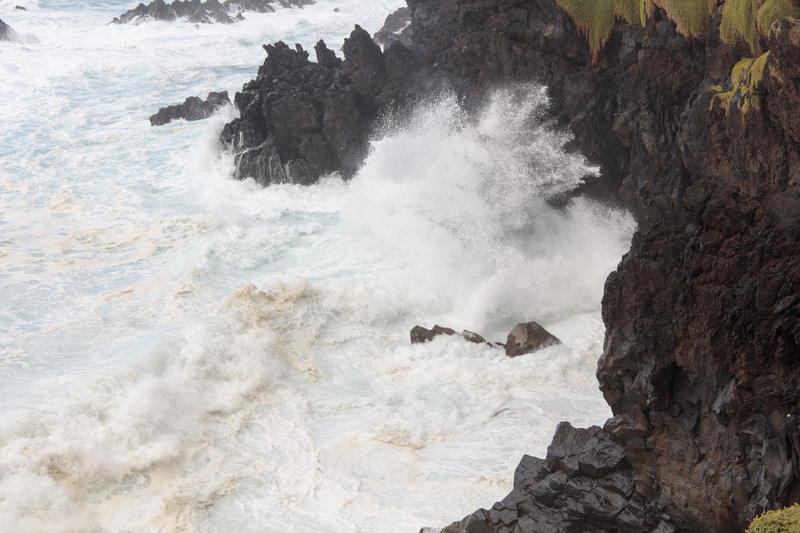 In the 15th and 16th centuries Madeira was a major producer of sugar which was known as ‘white gold’. The current distillery makes rum. 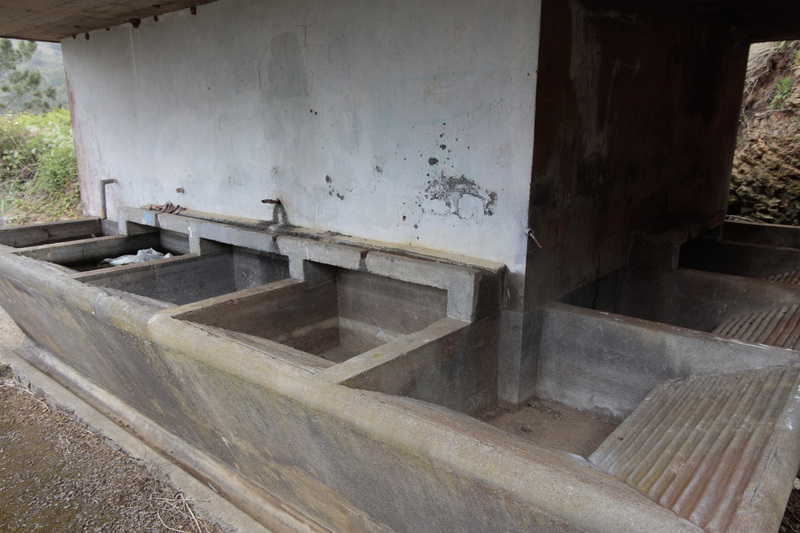 They have a machine used to pump fresh sugarcane juice up to the fermentation tanks which was manufactured by Jones Burton & Co of Liverpool. Another piece of machinery was made in Oakland, California. 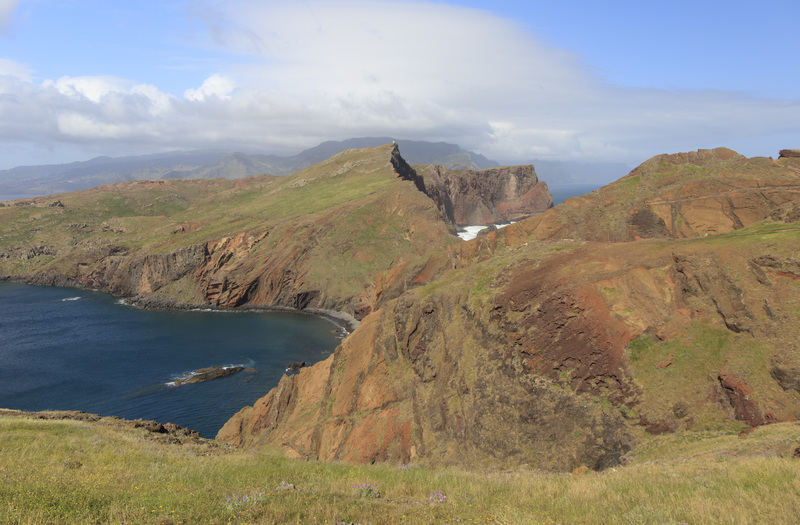 Further on, Faial has a hill 598m high called ‘Eagle Rock’ where ospreys nest. 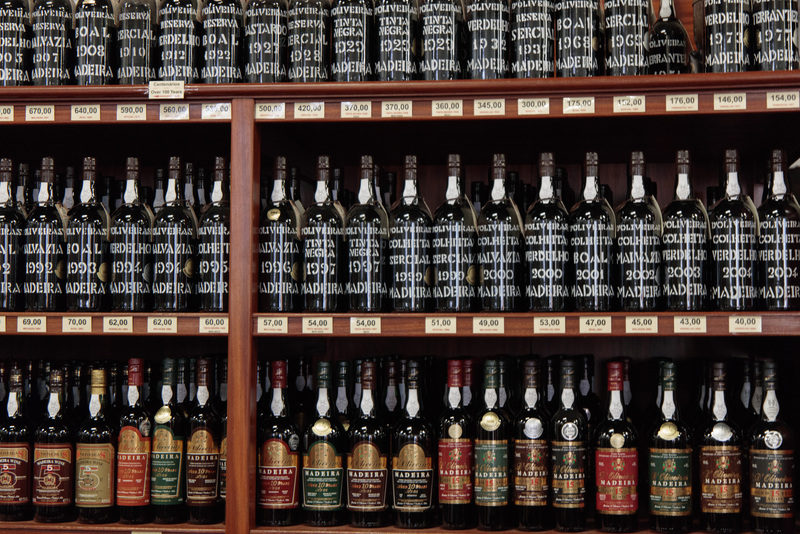 Nearby we had a madeira wine tasting session in a cellar, sampling 12 year old and 19 year old samples. Returning to the road we passed several people (some in national costume) returning to the church following the blessing of a house which often takes place after Easter. 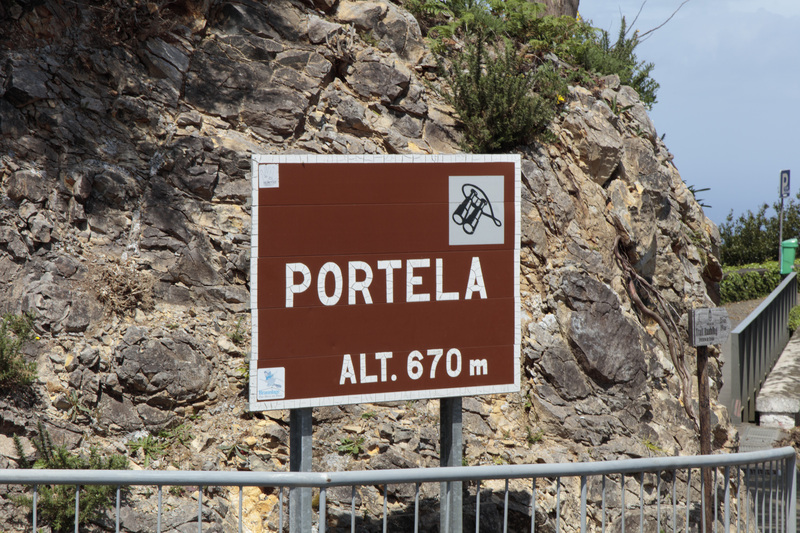 The new road passes through the longest tunnel in Europe which is over 3km long. New road construction and tunnel building has expanded in Madeira in the last few years and has improved communications and transport. However, there is a feeling amongst some, that it is going too far. Our destination was Santana, our base for the night. 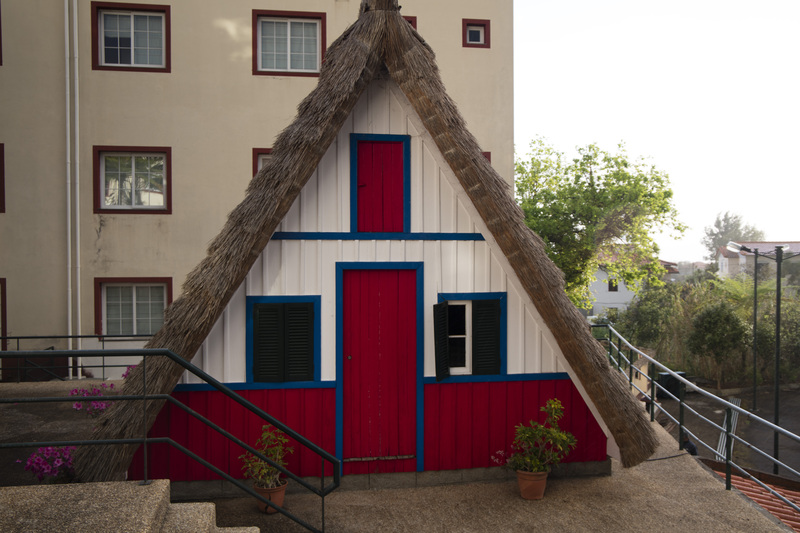 It is renowned for the traditional thatched A frame houses in the area. The weather was now deteriorating. 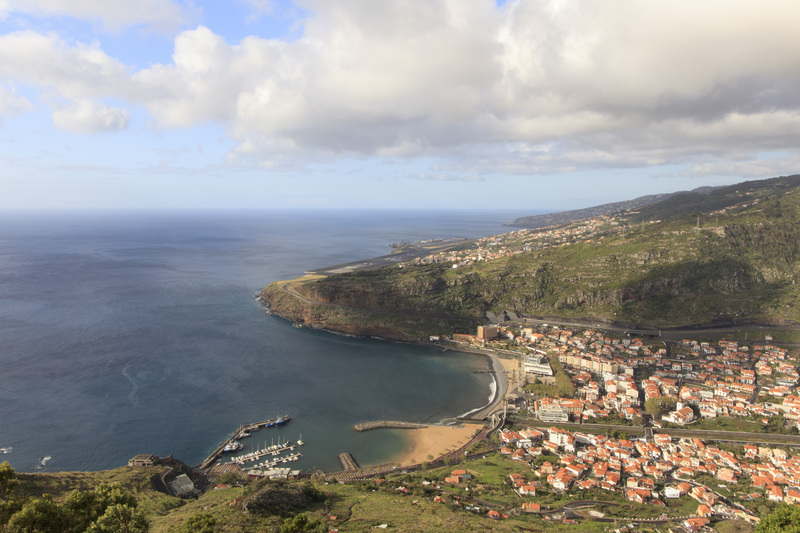 The jet stream has diverted further south this year leaving northern Europe with a much colder spring but wetter weather occurring further south, including Madeira.